PAGES FROM THE INTERNET SO I CAN ARCHIVE THEM IN THE EVENT THAT A ROGUE AT HOMESTEAD, WHO IS ACCEPTING A BRIBE OFFER FROM THE ISRAELI POLICE, DELETES OR ALTERS THEIR CONTENT AND ALSO FOR COPYRIGHT PURPOSES. WHEN I ATTEMPT TO MAKE A PORTABLE DOCUMENT FILE COPY OF A WEB PAGE ON MY WEBSITE FROM THE INTERNET IT DOES NOT GET COMPLETELY COPIED. THE COLORED TEXT BOX IN HOMESTEAD’S WEBSITES MANAGER CONTAINS ALL OF THE TEXT OF A WEB PAGE. HOWEVER, WHEN I PUBLISH A WEB PAGE ONTO THE INTERNET I AM ONLY ABLE TO COPY FROM THE INTERNET A PORTION OF A WEB PAGE FROM THE COLORED TEXT BOX. THE REST OF THE TEXT SHOWS UP BEYOUND THE COLORED TEXT BOX AT THE BOTTOM OF THE WEB PAGE IN BLACK. THEREFORE, IT DOES NOT REFLECT THE CONFIGURATION OF THE WEB PAGE WHEN IT WAS PUBLISHED. THEREBY, THE COPY IS NOT AN AUTHENTIC COPY OF MY WEB PAGE. IN ORDER FOR ME TO ACQUIRE A PROPER COPY OF A WEB PAGE FROM THE INTERNET I HAVE TO REPEATEDLY ADD BLANK SPACES TO THE END OF MY TEXT IN THE COLORED TEXT BOX IN HOMESTEAD’S WEBSITES MANAGER. AFTERWARDS, I HAVE TO RESTORE THE WEB PAGE BY REMOVING THE BLANK SPACES FROM THE END OF MY TEXT IN THE COLORED TEXT BOX OF HOMESTEAD’S WEBSITES MANAGER IN ORDER TO MAKE IT PRESENTABLE TO INTERNET USERS. THIS IS VERY LABORIOUS, TEDIOUS AND UNNECESSARY. FOR THE ENTIRE FIVE YEARS THAT MY WEBSITE HAS BEEN HOSTED BY HOMESTEAD I HAVE NOT EVER HAD TO DO SUCH A THING. 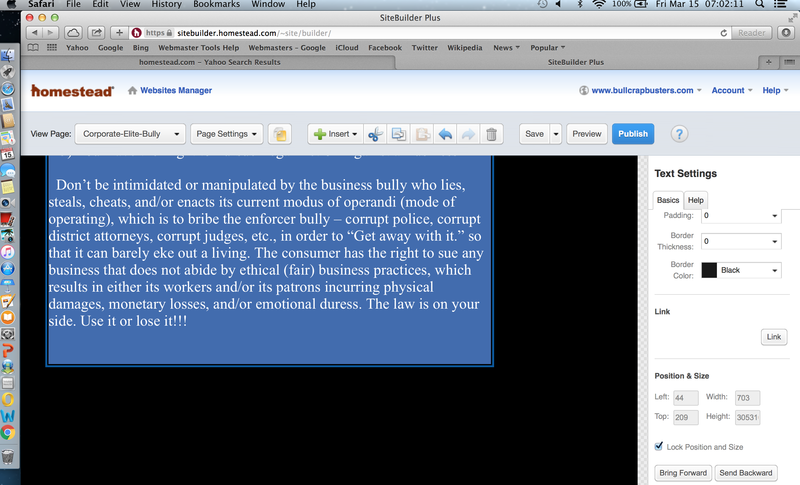 THE FIRST IMAGE IS OF A SERIES OF SCREEN SHOTS THAT I MADE OF THE END OF MY TEXT ON THE COLORED TEXT BOX IN HOMESTEAD’S WEBSITES MANAGER FOR MY WEB PAGE CALLED, “CORPORATE ELITE BULLY”. [READER'S NOTE: NOTICE HOW THE DATE STAYS THE SAME BUT HOW EACH TIME STAMP KEEPS CHANGING FROM AN EARLIER TO A LATER TIME. BOTH DATE AND TIME ARE IN THE UPPER RIGHT CORNER]. 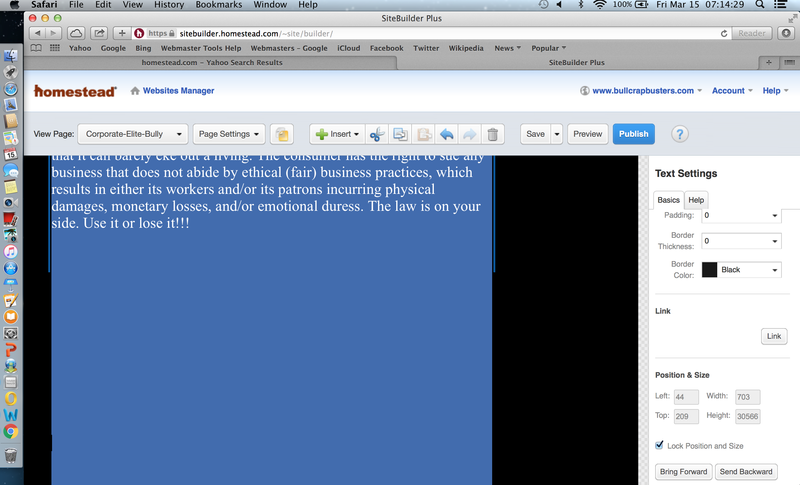 THE SECOND IMAGE IS A SERIES OF SCREEN SHOTS THAT I MADE OF HOMESTEAD'S CONFIRMATION PAGES SHOWING THAT HOMESTEAD PUBLISHED ONTO THE INTERNET MY WEB PAGE CALLED, “CORPORATE ELITE BULLY”. THE THIRD IMAGE IS A SERIES OF PRINTED COPIES THAT I MADE FROM THE INTERNET SHOWING ONLY A PORTION OF THE TEXT FROM MY WEB PAGE CALLED, “CORPORATE ELITE BULLY” APPEARING ON THE COLORED TEXT BOX OF HOMESTEAD’S WEBSITES MANAGER. THE ONLY REASONABLE CONCLUSION I CAN MAKE FROM THIS OBSERVATION IS THAT THE ISRAELI POLICE HAVE OFFERED A BRIBE THAT A ROGUE AT HOMESTEAD ACCEPTED IN ORDER TO CENSOR MY BULLCRAP BUSTERS WEBSITE OFF OF THE INTERNET BECAUSE I HAVE EXPOSED THE ISRAELI POLICE FOR TAKING BRIBES THAT ENDANGER INNOCENT PEOPLES’ LIVES. [SEE THE WEB PAGE CALLED “UPDATES 8/10/18” OF THE BULLCRAPBUSTERS WEBSITE FOR DETAILS]. THE ALIGNMENT FUNCTION CHANGED WITHOUT MY AUTHORIZATION. I ALIGNED TO THE LEFT MARGIN MY TEXT ON MY WEB PAGE CALLED, “CORPORATE ELITE BULLY” WITH THE EXCEPTION OF TITLES AND SUBTITLES, WHICH I ALIGNED CENTRALLY. 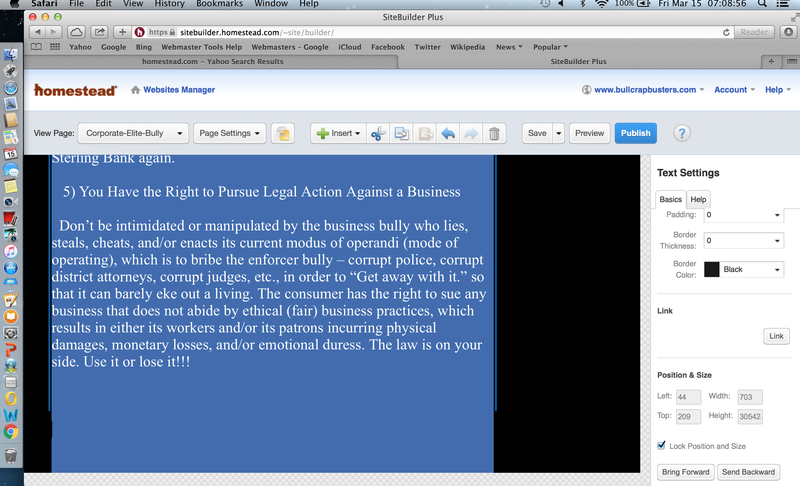 ON FIVE OF THE PRINTED COPIES ON THE INTERNET THAT I MADE OF MY WEB PAGE CALLED, “CORPORATE ELITE BULLY”, THE TEXT WAS CORRECTLY ALIGNED TO THE LEFT MARGIN WITH THE EXCEPTION OF TITLES AND SUBTITLES, WHICH WERE ALIGNED CENTRALLY. BUT THE SIXTH AND FINAL PRINTED COPY ON THE INTERNET THAT I MADE OF MY WEB PAGE CALLED, “CORPORATE ELITE BULLY” HAD ALL OF ITS TEXT INCLUDING THE TITLES AND SUBTITLES INCORRECTLY ALIGNED TO THE CENTER. IF THE READER IS INTERESTED IN VEIWING THE SIXTH PRINTED COPY OF MY WEB PAGE CALLED "CORPORATE ELITE BULLY" THAT WAS ALIGNED IMPROPERLY THEN PLEASE GO TO THE FOLLOWING HYPERLINK 18C AT WWW.BULLCRAP BUSTERS.COM. IT IS A VERY LONG WEB PAGE (THE LONGEST WEB PAGE IN MY WEBSITE). IT TOOK ME THREE HOURS TO RE-ALIGN IT PROPERLY. THE ONLY REASONABLE CONCLUSION I CAN MAKE FROM THIS OBSERVATION IS THAT THE ISRAELI POLICE HAVE OFFERED A BRIBE THAT A ROGUE AT HOMESTEAD ACCEPTED IN ORDER TO CENSOR MY BULLCRAP BUSTERS WEBSITE OFF OF THE INTERNET SINCE I HAVE EXPOSED THE ISRAELI POLICE FOR TAKING BRIBES THAT ENDANGER INNOCENT PEOPLES’ LIVES. I AM PAID UP FOR THIS MONTH. THE BULLCRAP BUSTERS WEBSITE WILL TRANSMIT ITS SIGNALS OVER THE INTERNET FOR AS LONG AS WE HAVE NOT BEEN CENSORED OFF THE WEB BY ROGUES AT HOMESTEAD FOR DARING TO EXERCISE OUR HUMAN RIGHTS, NAMELY FREEDOM OF SPEECH, IN ORDER TO ASSIST HUMANITY IN OVERCOMING BULLYING. IS TRYING TO GET RID OF MY WEBSITE??? The Israeli Police is censoring the BullCrap Busters website off of the Internet by using Snippets to get rid of a good meta-description by replacing it with a bad meta- description for the Mask and Faces web page of the BullCrap Busters website. ON MARCH 2, 2019, I NOTICED THAT THE GOOGLE SNIPPETS ARE BACK ALONG WITH THE “ABOUT THIS RESULT” HYPERLINK ON THE GOOGLE SNIPPET BOX ALONG WITH GOOGLE’S “ABOUT THIS RESULT” WEB PAGE AND THE GOOGLE “FEEDBACK” HYPERLINK ON THE GOOGLE SNIPPET BOX ALONG WITH GOOGLE’S “FEEDBACK” WINDOW ATTACKING THE META-DESCRIPTION FOR THE MASKS AND FACES WEB PAGE OF THE BULLCRAP BUSTERS WEB SITE. It is a perfect meta-description for the masks and faces web page of the BullCrap Busters web site, as it describes perfectly what the masks and faces web page is all about. If the reader is interested in viewing Mask and Faces Meta-Description then please go to hyperlink 114 at www.bullcrapbusters.com. If the reader is interested in viewing Google’s Snippet Box of the Mask and Faces Meta-Description then please go to hyperlink 115A at www.bullcrapbusters.com. If the reader is interested in viewing the “About This Result” hyperlink on the Google’s Snippet Box then please go to hyperlink 115B at www.bullcrapbusters.com. If the reader is interested in viewing Google’s “Featured Snippets in Search” web page then please go to hyperlink 115C at www.bullcrapbusters.com. If the reader is interested in viewing Google’s “Feedback” hyperlink on Google’s Snippet Box then please go to hyperlink 115D at www.bullcrapbusters.com. If the reader is interested in viewing Google’s “Feedback” window then please go to hyperlink 115E at www.bullcrapbusters.com. If the reader is interested in viewing Google’s “Help Improve Google Search Results” web page then please go to hyperlink 115F at www.bullcrapbusters.com. SEE THE SECTION CALLED “SNIPPETS!! !” AND THE SECTION CALLED “THE SNIPPET DILEMMA” AND THE SECTION CALLED “THE SNIPPET TRAP” AND THE SECTION CALLED "THE KEY WORD CHANGE" BELOW ON THIS WEB PAGE OF THE BULLCRAPBUSTERS WEBSITE FOR DETAILS. THE ONLY REASONABLE CONCLUSION I CAN MAKE FROM THIS OBSERVATION IS THAT THE ISRAELI POLICE HAVE OFFERED A BRIBE THAT A ROGUE AT GOOGLE ACCEPTED IN ORDER TO CENSOR MY BULLCRAP BUSTERS WEBSITE OFF OF THE INTERNET BECAUSE I HAVE EXPOSED THE ISRAELI POLICE FOR TAKING BRIBES THAT ENDANGER INNOCENT PEOPLES’ LIVES. THE BULLCRAP BUSTERS WEBSITE WILL TRANSMIT ITS SIGNALS OVER THE INTERNET FOR AS LONG AS WE HAVE NOT BEEN CENSORED OFF THE WEB BY ROGUES AT GOOGLE FOR DARING TO EXERCISE OUR HUMAN RIGHTS, NAMELY FREEDOM OF SPEECH, IN ORDER TO ASSIST HUMANITY IN OVERCOMING BULLYING. The Israeli Police is censoring the BullCrap Busters website off of the Internet by using Snippets to get rid of a good meta-description along with its photo image by replacing it with a bad meta-description and bad photo image for the Mask and Faces web page of the BullCrap Busters website. If the reader is interested in viewing Googles Snippet box of the Mask and Faces Meta-Description along with the Mask and Faces Photo Image then please go to hyperlink 105F at www.bullcrapbusters.com. That way, potential visitors will not visit the Mask and Faces web page, which for the last four years has been serving as the home page – entry point – to the entire BullCrap Busters web site. In the entire four years that the BullCrap Busters web site has been on the Internet the search engine bots simply crawled the meta-description for the Masks and Faces web page of the BullCrap Busters web site. There were not ever any snippets involved. If the reader is interested in viewing Mask and Faces Meta-Description then please go to hyperlink 105E at www.bullcrapbusters.com. The Snippet is above the meta-description for the Masks and Faces web page of the BullCrap Busters web site. If the reader is interested in viewing Googles Snippet box then please go to hyperlink 105A at www.bullcrapbusters.com. How do I know the Israeli Police bribed a rogue at Google to insert a Snippet onto the Google search engine involving the Mask and Faces web page of the BullCrap Busters web site? One week after I sent e-mail #9 to the Ministry of Public Security, I noticed that when I inserted the search phrase of “bully’s ruses” into the search engine of Google, above the meta-description for the Masks and Faces web page of the BullCrap Busters web site was a Snippet. I did not know what a Snippet was. So I clicked on the “About this result” hyperlink on the Snippet box to find out. If the reader is interested in viewing Googles “about this result” hyperlink then please go to hyperlink 105A at www.bullcrapbusters.com. If the reader is interested in viewing Googles “featured snippets in search” web page then please go to hyperlink 105B at www.bullcrapbusters.com. WHAT THIS MEANS IS THAT THE PURPOSE OF A SNIPPET IS TO ANSWER A QUESTION. If the reader is interested in viewing the article illustrating Googles Snippets being used for the above answer to the above question then please go to hyperlink 105G at www.bullcrapbusters.com. THE PURPOSE OF A SEARCH PHRASE SUCH AS “BULLY’S RUSES” IS TO LOCATE WEB PAGES. I DID NOT ASK A QUESTION. SO I DO NOT REQUIRE AN ANSWER. I inserted the search phrase “bully’s ruses” in order to locate web pages with the phrase “bully’s ruses” in them. So a Snippet is not supposed to be displayed when a user enters a search phrase. And the meta-description for the Masks and Faces web page of the BullCrap Busters website does not supply answers. The meta-description for the Masks and Faces web page of the BullCrap Busters website furnishes information about the Masks and Faces web page of the BullCrap Busters website. So a Snippet is NOT supposed to be displayed with the meta-description for the Masks and Faces web page of the BullCrap Busters website. It was not the Google bot that put this Snippet above my meta-description for the Mask and Faces web page of the BullCrap Busters website. It was a rogue at Google who accepted a bribe offer from the Israeli Police who put this Snippet above my meta-description for the Mask and Faces web page of the BullCrap Busters website. WHAT THIS MEANS IS THAT I CANNOT REQUEST THAT GOOGLE REMOVE ITS SNIPPET FEATURE. FOR IF I DO, THE GOOGLE BOTS WILL ALSO REMOVE THE SNIPPETS IN REGULAR SEARCH RESULTS, WHICH IS THE META-DESCRIPTION ITSELF OF THE MASK AND FACES WEB PAGE OF THE BULLCRAP BUSTERS WEBSITE. I also clicked on the "Feedback" hyperlink of the Snippet box to discover what it was all about. If the reader is interested in viewing Googles “feedback” hyperlink then please go to hyperlink 105A at www.bullcrapbusters.com. A survey inquiring as to what the public thinks of the meta-description from the Mask and Faces web page of the BullCrap Busters website. “The data you provide helps improve Google search” with a hyperlink that says, “Learn more”, which leads you to a Google web page called “Help improve Google search results”. 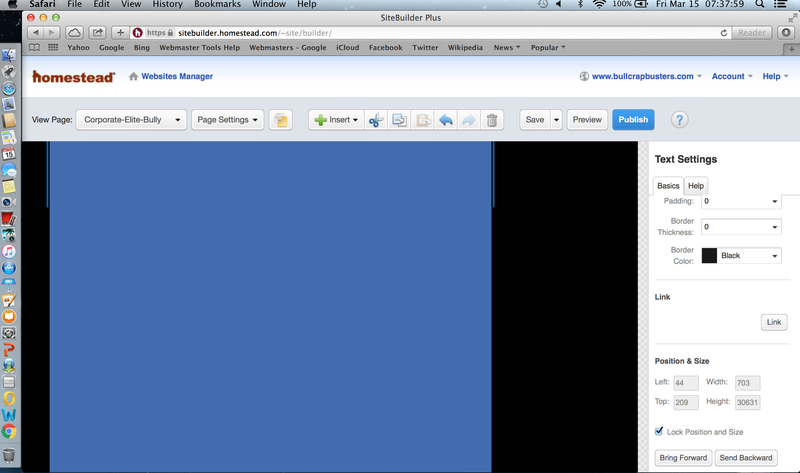 If the reader is interested in viewing Googles “feedback” window then please go to hyperlink 105C at www.bullcrapbusters.com. If the reader is interested in viewing Googles “help improve Google search results” web page then please go to hyperlink 105D at www.bullcrapbusters.com. And therein you have it, the word “Change”, which is the key word describing why the Israeli Police bribed a rogue at Google to make a Snippet be on the Google Search Engine above the meta-description for the Mask and Faces web page of the BullCrap Busters website. The word change is an invitation to the public to remove the good meta-description for the Mask and Faces web page of the BullCrap Busters website and replace it with a bad meta-description for the Mask and Faces web page of the BullCrap Busters website. I am not concerned about the public, as these people will approve of the good meta-description for the Mask and Faces web page of the BullCrap Busters website being that it accurately describes what is on its web page. Hence, they will request that Google keep it. For it is the best Google search result. I am concerned about the so-called public, as these people will have been given a bribe by the Israeli Police to disapprove of the good meta-description for the Mask and Faces web page of the BullCrap Busters website. Thus, they will request that Google remove it to replace it with a bad meta-description that will mislead visitors as to what its web page is all about. For a so-called better Google search result. GOOGLE IS NOT EVEN AUTHORIZED TO DO THIS PUBLIC SURVEY BECAUSE THERE OUGHT NOT BE ANY SNIPPET INVOLVED WITH THE META-DESCRIPTION OF THE MASK AND FACES WEB PAGE OF THE BULLCRAP BUSTERS WEBSITE SINCE THE SEARCH PHRASE “BULLY’S RUSES” IS NOT AN INQUIRY. On November 13, 2018, i clicked on the Google Search Engine using the search phrase of “bully’s ruses”. And I noticed that the Snippet box is still there. But the Snippet box no longer has the “About this result” or the “Feedback” hyperlinks in it, which it did on October 23, 2018. If the reader is interested in viewing Googles Snippet box, as it looked on 10/23/18 then please go to hyperlink 105A at www.bullcrapbusters.com. If the reader is interested in viewing Googles Snippet box, as it looks on 11/13/18 then please go to hyperlink 106 at www.bullcrapbusters.com. It went to a second Snippet box on the Google Search Engine web page. If the reader is interested in viewing Googles Second Snippet box then please go to hyperlink 106A at www.bullcrapbusters.com. So I clicked on it again. It went to a third Snippet box on the Google Search Engine web page. If the reader is interested in viewing Googles Third Snippet box then please go to hyperlink 106B at www.bullcrapbusters.com. So I clicked on it yet again. It went to a "Page Not Found". If the reader is interested in viewing the Page Not Found web page then please go to hyperlink 106C at www.bullcrapbusters.com. THE SNIPPET MAZE IS A CENSORSHIP OF THE BULLCRAP BUSTERS WEBSITE. FOR ITS PURPOSE IS TO GET YOU, THE READERS OF THE BULLCRAP BUSTERS WEBSITE, LOST. SO THAT YOU CANNOT LOCATE THE WEB PAGE CALLED, “UPDATES 8/10/18”, WHICH EXPOSES TO THE INTERNET PUBLIC THAT THE ENTIRE ISRAELI POLICE FORCE OF THE ENTIRE STATE OF ISRAEL ARE BRIBE-STERS – TAKE BRIBES THAT HURT AND HARM PEOPLES’ LIVES. The Israeli Police Force reminds me of a scene in a movie called, “Liar Liar”. Instead of doing all of these Snippets in order to Censor the BullCrap Busters website, why don't the Israeli Police do what the lawyer played by actor Jim Carey told one of his clients to do, who was continuously breaking the law? "Stop breaking the law!" THE ONLY REASONABLE CONCLUSION I CAN MAKE FROM THIS OBSERVATION IS THAT THE ISRAELI POLICE HAVE OFFERED A BRIBE THAT A ROGUE AT GOOGLE ACCEPTED IN ORDER TO CENSOR MY BULLCRAP BUSTERS WEBSITE OFF OF THE INTERNET SINCE I HAVE EXPOSED THE ISRAELI POLICE FOR TAKING BRIBES THAT ENDANGER INNOCENT PEOPLES’ LIVES. WEBSITE ON THE YAHOO SEARCH ENGINE!!! THE ONLY REASONABLE CONCLUSION I CAN MAKE FROM THIS OBSERVATION IS THAT THE ISRAELI POLICE HAVE OFFERED A BRIBE THAT A ROGUE AT YAHOO ACCEPTED IN ORDER TO CENSOR MY BULLCRAP BUSTERS WEBSITE OFF OF THE INTERNET BECAUSE I HAVE EXPOSED THE ISRAELI POLICE FOR TAKING BRIBES THAT ENDANGER INNOCENT PEOPLES’ LIVES. THE BULLCRAP BUSTERS WEBSITE WILL TRANSMIT ITS SIGNALS OVER THE INTERNET FOR AS LONG AS WE HAVE NOT BEEN CENSORED OFF THE WEB BY ROGUES AT YAHOO FOR DARING TO EXERCISE OUR HUMAN RIGHTS, NAMELY FREEDOM OF SPEECH, IN ORDER TO ASSIST HUMANITY IN OVERCOMING BULLYING. 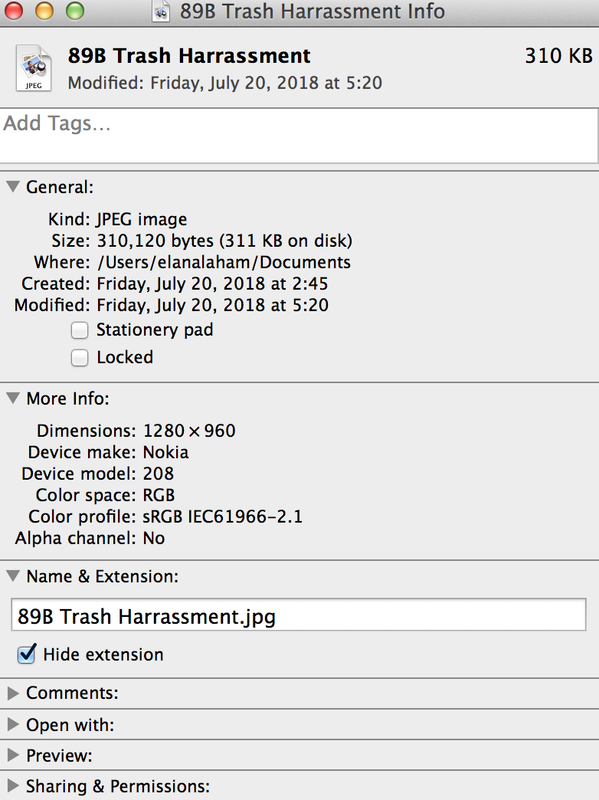 …then Protect their own Reputation by doing their job, which is to conduct an Investigation of the trash and threatening note that I have reason to believe belong to Susana Vexler. The Police are so blinded, deafened, and dumbed down by their own mean, stupid, selfish, lazy, arrogant, lying, flunky selves that they are not willing to do what is in their own best interest. Or maybe I am mistaken. Perhaps, the negative worldwide Internet exposure they are getting does not BOTHER them. But, if that were so, then why is it that whenever I post something on this web page about the Israeli Police Force, the Israeli Police Force uses the Israeli Peoples' tax dollars to bribe a rogue at Google to put their Google Snippet back on the Google search engine? On and off and on and off and on and off the Schizophrenic or maybe it ought to be called, “Schitzo-Frantic” Google Snippets go! Its like a lover who keeps saying, “Does she love me or does she love me not?” while plucking petals one by one off of a rose. …During the entire four months of this Police Saga, the Police kept ringing my spouse and I on our cell phones. Of course we did not answer our phones because I had explicitly and repeatedly instructed the Police via my correspondences to them to communicate with me in writing only so that I can document what they say. During the entire four months of this Police Saga, the Police kept banging on and shouting at my spouse’s apartment door where they believe I am staying. Of course my spouse did not answer his door since I had explicitly and repeatedly instructed the Police via my correspondences to them to communicate with me in writing only so that I can document what they say. The Police kept attempting to insidiously intimidate and/or manipulate me to remove them from my BullCrap Busters Website with their “Doughnut” talk. Clearly the Police are very UPSET that they are being EXPOSED on the Internet. The Israeli Police Force reminds me of a scene in a movie called, “Monty Python's Holy Grail”. The scene occurs in a forest in which two knights in black armor are fighting. One knight cleaves the other knight’s right arm off with his sword followed by the left arm followed by the right leg followed by the left leg. The victorious knight starts to leave when the defeated knight who can no longer hold his sword or his shield and has nothing left of him but his torso and head insists on continuing the fight. The victorious knight stares down at the defeated knight as if he is insane and in disbelief walks away. The enforcer Bully Coward Police are hoping that you will believe that they are invincible, untouchable, and unbreakable by trying to HIDE their PAIN of the embarrASSment that they are to themselves and to the Whole Internet World. ...ACCEPTS BRIBE OFFERS FROM CRIMINALS THAT HURT AND HARM AND/OR ENDANGER INNOCENT PEOPLES’ LIVES. For every day that goes by that the Israeli Police Force refuses to do their job is yet another day that more and more Israelis will read my web page and know that their tax paying money is being spent to employ these corrupt public officials who do not take their job seriously. And the rest of the people on the planet will be equally incensed that they too are being threatened by such a trend. ...Although I do not believe that the Israeli Police Force will change their irrational mind for a rational mind, out of concern for Public Safety I will continue to offer to remove all that I have stated on this web page about the Israeli Police Force if they will do their job by conducting a proper Investigation of the trash and threatening note that I have reason to believe belong to Susana Vexler. If the reader is interested in viewing this above e-mail sent to the entire Israeli Police Force then please go to hyperlink 113 at www.bullcrapbusters.com. 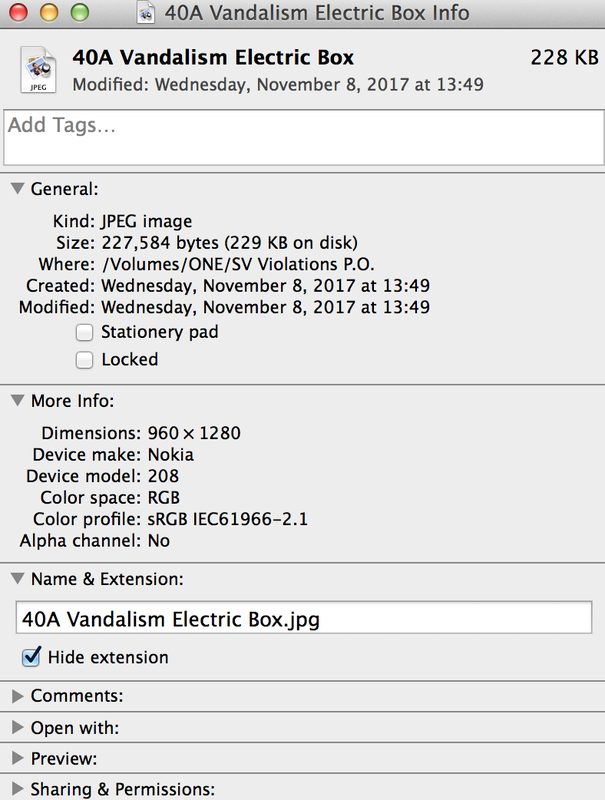 On November 27, 2018, I sent the following e-mail to the Coordinator of Public (Police) Complaints, whose name is Revital Ovadia Gispan. I received your e-mail dated November 25, 2018 for your assigned Case# 74701/18. If the reader is interested in viewing the e-mail that the Public Complaints Department sent to me on November 25, 2018 in English then please go to the following hyperlink 108C at www.bullcrapbusters.com. SO…stop blaming the victim for being a victim of bullying! The Police did not do their job, which was to enforce my Protection Orders that the Court granted me against my neighbor Susana Vexler. SO…I had to make all of these complaints. If you do not like receiving complaints from me then you need to instruct the Police to do their job. You are SO busy taking BRIBES from Susana Vexler and David Bukrees and others that you refuse to do your job, which includes doing an INVESTIGATION on the Trash that I have reason to believe Susana Vexler put by my door in violation of the Protection Orders I had against her, and the Threatening Note that I have reason to believe Susana Vexler addressed to me, which is a CRIME all by itself. Why won’t you do the INVESTIGATION? What are you COWARDS afraid of? 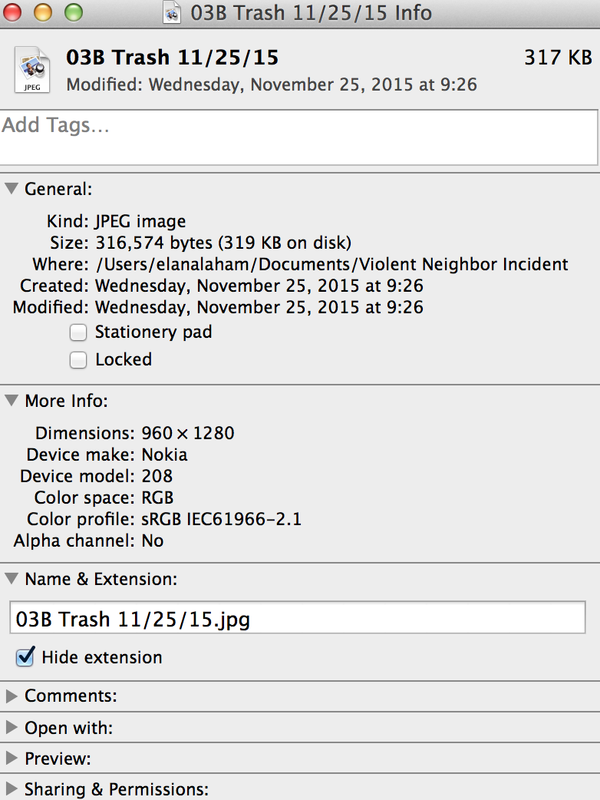 Are you afraid that Susana Vexler’s fingerprints are all over the Trash and the Threatening Note? Being that Susana Vexler BRIBES OFFICIALS I bet she is either too stupid or too lazy or too arrogant to be careful not to incriminate herself with her own criminal actions, isn’t she? 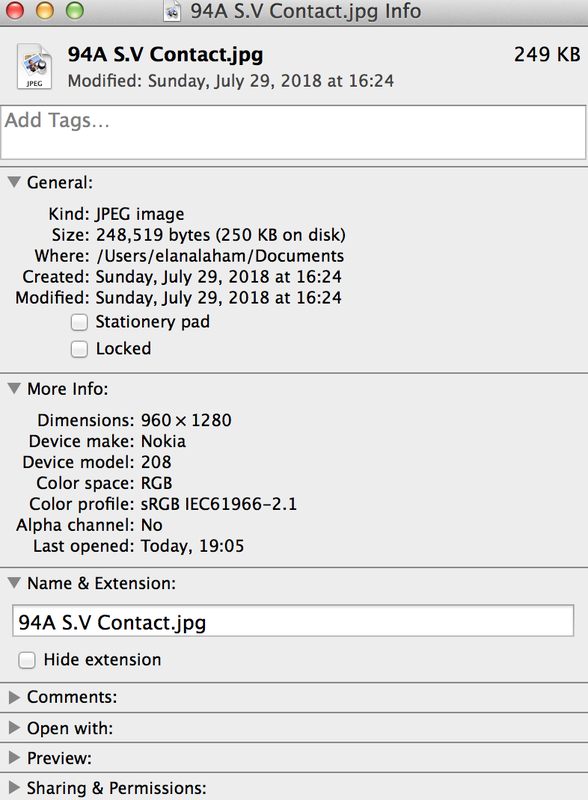 I received your e-mail dated October 28, 20018 for your assigned Case# 74701/18. If the reader is interested in viewing the e-mail that the Public Complaints Department sent to me on October 28, 2018 in English then please go to the following hyperlink 107C at www.bullcrapbusters.com. It is truly pathetic and truly pitiful that you took one whole month to lie to me that the lying police are doing their job and according to the law. As God is my witness, BULLCRAP!!! People have DIED SO that Israel can be born again. People are DYING all over the world, please, thank you, and you are welcome to POLICE BRIBE-STER BULLYING. What is the matter with you SO called people that you have this belief that you are better than the rest of us? I am sorry that your parents did not raise you right. But that is no excuse for you to refuse to do your job of enforcing the LAW and protecting the INNOCENT. You are an adult now. SO stop acting like an adulterated, spoiled, rotten brat. It will have been better for you if you had not sent to me any reply being that this reply that you have sent to me only makes the WORLD WIDE PUBLIC ever the more DISGUSTED than ever before with you and your SO called Israeli Police Force. If you are interested in viewing your SO called Investigation e-mail reply to me and this e-mail reply back to you from me then go to website (URL) www.bullcrapbusters.com and go to web page “Updates 8/10/18” under section “E-mail #10” to know what the entire Internet World is reading about you. If you continue to CENSOR my Website then all you are doing for yourself is letting the entire Internet World know that I am right that you are BRIBE-STERS – POLICE WHO TAKE BRIBES THAT HURT AND HARM PEOPLES’ LIVES. SO whether or not you decide to do your job that we, the People, hired you to do with our taxpayers’ money, we win and you lose. ...OH LOOK THE ISRAELI POLICE FORCE HAS USED THE ISRAELI PEOPLES' TAX DOLLARS AS A BRIBE FOR A ROGUE AT GOOGLE TO PUT THEIR GOOGLE SNIPPET ON THE GOOGLE SEARCH ENGINE. I am writing this correspondence to bring to your attention that I am a tax paying Israeli citizen, yet I am being denied my inalienable right to be kept safe from violent and crazy people. I have had to file FOUR Police Reports against my neighbor because my neighbor in contempt of Court violated TWO Protection Orders I had against her FIVE TIMES, had her boyfriend committed assault and battery on me TWO TIMES, and HARASSED me for THREE YEARS because I did not agree with her putting her trash on my side of the hallway. In addition, my neighbor also addressed a THREATENING NOTE to me. With or without a Protection Order it is a CRIME to make threats. The threatening note communicates that my neighbor intends to continue to HARASS me and the threatening note is vague. So the threat can mean anything from vandalizing my property to stealing my belongings to murdering me. And my neighbor is perfectly capable of enacting violence against me as she already had her boyfriend commit assault and battery on me. 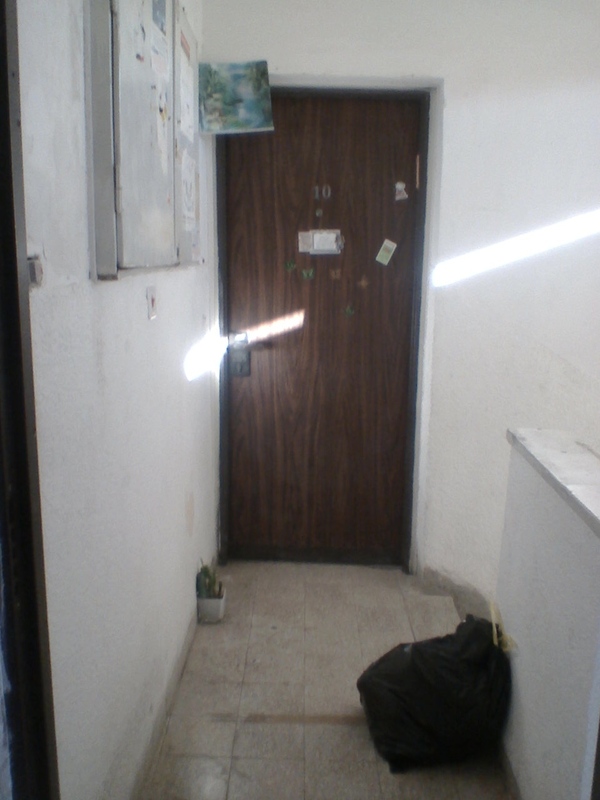 Yet the Karmiel Police Department refused to enforce my Protection Orders against my neighbor and ignored the Threatening Note my neighbor addressed to me. I repeatedly wrote to the Chief of Police of the Karmiel Police Department, whose name is HORI RAMI, at carmiel@police.gov.il, with courtesy copies sent to the following three e-mail addresses listen@police.gov.il, moked110@police.gov.il, mahoz.zafon@police.gov.il. I requested that he conduct an investigation on the threatening note that I have reason to believe my neighbor addressed to me for the Police to question her, dust for her fingerprints, and get a handwriting sample from her in order to prove whether or not she wrote this note. 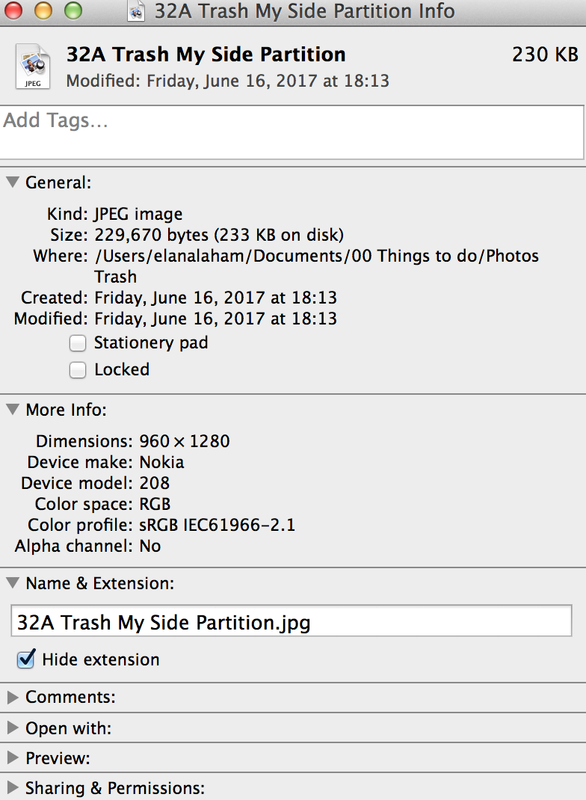 I also requested that he conduct an investigation on the trash that I have reason to believe my neighbor deposited against my apartment door in contempt of court and in violation of my Protection Orders against her for the Police to question her, and dust for her fingerprints in order to prove whether or not the trash is hers. Yet I did not ever receive a reply from either the Chief of Police Hori Rami or any one else within the Israeli Police Organization. Further details, artifacts, and documentation regarding the above matter can be obtained from my web site (URL) www.bullcrapbusters.com on my web page (html) “Updates 8/10/18”. Based on the observables, the only reasonable conclusion I can make is that the Chief of Police Hori Rami and Police Officer Moshe Chedeedah are Bribe-sters – police who take bribes that hurt and harm peoples’ lives. The Israeli Police already tried to CENSOR the BullCrap Busters website off of Yahoo with a Bribe. See my BullCrap Busters web site (URL) www.bullcrapbusters.com on my web page (html) “Attention BB Readers VII” and my web sites Homepage for details. Looking forward to your reply. No reply is also a reply. I will be posting your reply or non-reply on my website (URL) www.bullcrapbusters.com on the web page (html) “Updates 8/10/18” for the entire Internet world to know about. to elanalaora@gmail.com or via mail to P.O. 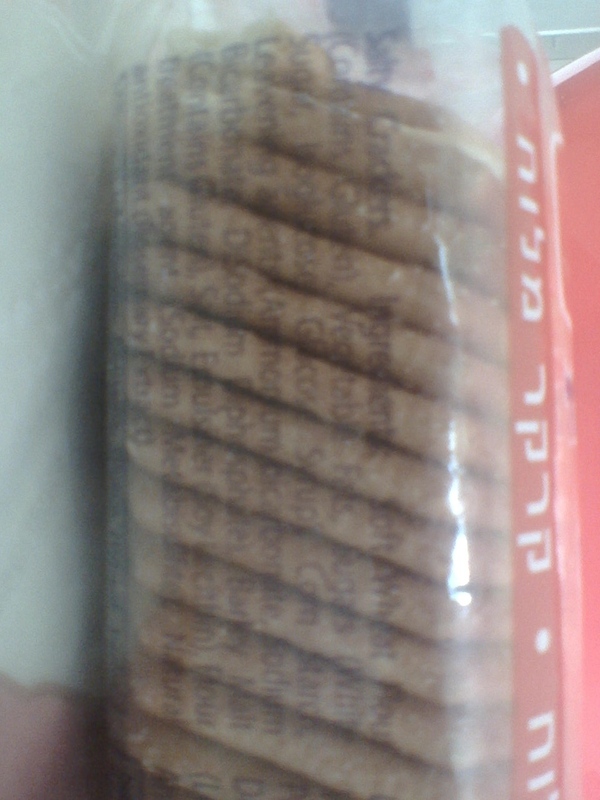 Box 50012, Karmiel 2160501, Israel. If the reader is interested in viewing e-mail #9 then please go to hyperlink 104 at www.bullcrapbusters.com. Due to bribery the Chief of the Karmiel Police Department, whose name is Hori Rami, had me arrested and incarcerated on fabricated charges. As a result of bribery the Head Judge of the Akko Magistrate Court, whose name is Ziad Salach, had me convicted of fabricated charges. The Queen Pin, whose name is Susana Vexler, had me killed. 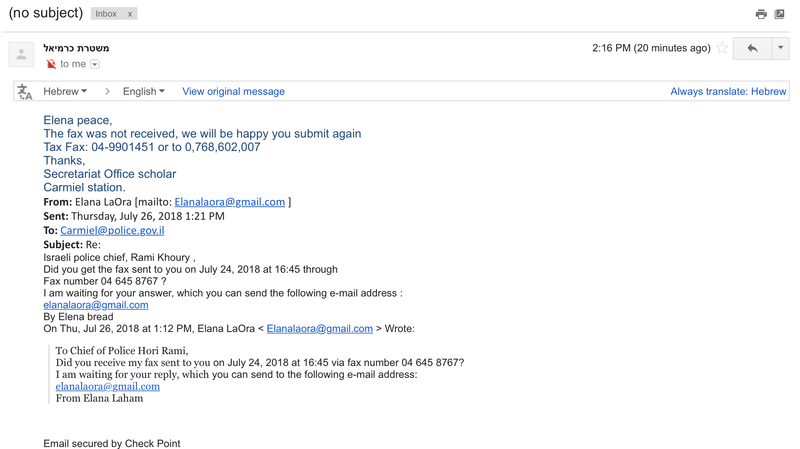 As I already stated to you in my previous e-mails to you dated August 3, 2018, if you want the negative Internet Publicity to go away then all you need to do is your DAMN JOB by conducting a PROPER INVESTIGATION of the threatening note, which is a crime, that I have reason to believe Susana Vexler addressed to me and the trash that I have reason to believe Susana Vexler deposited at my door in contempt of court and in violation of my protection orders against her. If the BullCrap Busters Website stops transmitting its signals over the Internet it will be because the Queen Pin, whose name is Susana Vexler, had me killedans since the public officials namely the Chief of the Karmiel Police Department, whose name is Hori Rami, and the Head Judge of the Magistrate Court, whose name is Ziad Salach, refused to do their jobs and protect me from violent and crazy bully cowards such as Susana Vexler. I have sent you numerous faxes and numerous e-mails for the last two months. Yet I have received no reply from you. So now you can enjoy your negative publicity on the Internet for the entire Internet world to know that you, Chief of Police Hori Rami, are a police officer who takes bribes that endanger peoples’ lives on my website www.bullcrapbusters.com on my web pages “Updates 8/10/18” and “Updates 9/14/18”, indefinitely. I am an Israeli citizen who pays my taxes. Yet you refuse to conduct an investigation on a threatening note, which is a crime, that I have reason to believe Susana Vexler addressed to me, and on the trash that I have reason to believe Susana Vexler deposited against my apartment door in contempt of court and in violation of my protection orders against her. You ignoring my repeated requests to conduct an investigation only proves to the public that Susana Vexler is a criminal and that you take bribes that endanger peoples’ lives from criminals such as her. Otherwise, why in the world do you refuse to investigate? I bet Susana Vexler’s fingerprints are all over the note and the trash. I bet you have hurt and harmed a lot of innocent people by taking dirty money from criminals – people who break the Law and people who are in contempt of Court. So, as a public service to humanity, I am happy to have the opportunity to expose you as the Bribe-ster that you are. And I reject you and your Karmiel Police Department since it is a Police Department of Bribery. THANK YOU to your POLICE OFFICER, I was FORCED to MOVE out of my HOME. On September 3, 2018, I vacated the apartment I was renting from landlord Menachem Snoyman (I had just renewed my Lease August 10, 2018), as my life was ENDANGERED because (I have reason to believe) my neighbor Susana Vexler wrote a threatening note to me and since (I have reason to believe) your Police Officer Moshe Chadeedah RUINED my relationship with my Landlord Menachen Snoyman. I have repeatedly requested of you to conduct an investigation on the threatening note that I have reason to believe Susana Vexler addressed to me by questioning her, dusting for her fingerprints, and getting handwriting samples from her to prove whether or not she wrote it. I have received no reply from you. Please be informed that my web page (html) “Updates 7/20/18” has been changed to "Updates 8/10/18". If you intend to reply to the e-mails I sent you then you must do so in writing so that I can document what you say. ...then Susana Vexler will continue to act in contempt of court by continuing to violate my Protection Order against her by escalating the conflict she has made against me by once again harboring violent males who will commit assault and battery upon me like her boyfriend, Vitlay Zezkav, already did. I have had to file four Police Reports against Susana Vexler for being in contempt of court since she violated my Protection Order against her because your Karmiel Police Department refuses to enforce my Protection Order against her. I am requesting that you conduct an investigation on the threatening note that I have reason to believe Susana Vexler addressed to me in contempt of court and in violation of my protection order against her for you to question her, dust for her fingerprints, and get a handwriting sample from her in order to prove whether or not she wrote this note. (I handled it with gloves. So it does not have my fingerprints on it). 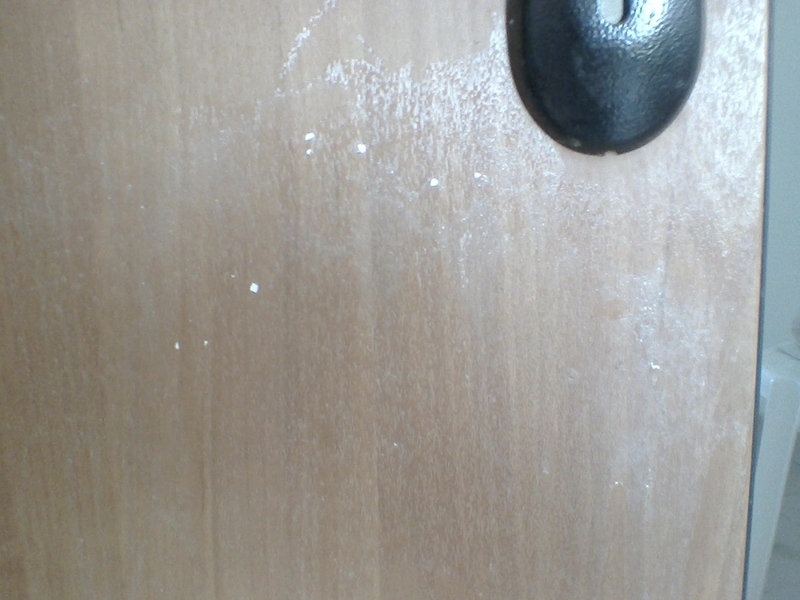 I am requesting that you conduct an investigation on the trash that I have reason to believe Susana Vexler deposited against my apartment door in contempt of court and in violation of the protection order against her for you to question her, and dust for her fingerprints in order to prove whether or not the trash is hers. (I handled it with gloves. So it does not have my fingerprints on it). That is if you are interested in doing your job versus accepting bribes that endanger peoples’ lives. (URL) www.bullcrapbusters.com on my web page “Updates 7/20/18” for the entire Internet world to know about as they develop regarding your Karmiel Police Department’s refusal to do their job by refusing to enforce the Protection Order that the Akko Magistrate Court granted me, Elana Laham, against Susana Vexler (Case #13488-04- 17), and whether or not you are going to do anything about it. Included in this e-mail are the Google, Yahoo, and Bing search engine web pages. See attachment 103 to this e-mail for details. You are the Chief of Police of the Karmiel Police Department so you are liable for the police conduct of all the police officers that work for your Karmiel Police Department. If you decide to do nothing about the biased treatment I am receiving from your police officers who are refusing to enforce my Protection Order against Susana Vexler by ignoring the threatening note that Susana Vexler addressed to me and the other incidents of harassment that Susana Vexler continues to enact against me and by denying me my Israeli citizen’s right to file a Police Report against them then I will expose all of you as police officers that accept bribes that endanger peoples’ lives for the entire Internet world to know about and you can enjoy your negative publicity on the Internet. But if you do your job by providing equal treatment to all Israeli citizens who seek Protection under the Law of Harassment then I will make positive posts for the entire Internet world to know about that you and your police department do not accept bribes that endanger people’s lives, and I will remove all the negative posts I have already posted about all of you on my BullCrap Busters website. I will be posting your reply or non-reply on my website for the entire Internet world to know about. On July 24, 2018, I sent you a fax regarding this matter with all the above attachments to fax number 04-6458767, which is the fax number on the Carmiel Police Department's website. It succeeded. I sent the same fax, to-fax number 04-9901446, which is the fax number on the Carmiel Police Report forms. It failed. On September 13, 2018, I sent the following fax to mahoz.zafon, which is the Israeli Police Northern District, whom we believe is COP Hori Rami's Boss. I received no reply from you or Chief of Police Hori Rami to any of them. On September 12, 2018, I received an e-mail from listen@police.gov.il informing me to contact you via fax via the fax number of 04-645-8787. On September 13, 2018, I sent the following e-mails to the fax number of 04-645-8787. The following are the e-mails I already sent to Chief of Police Hori Rami and to you. I am registering my complaint against Chief of Police Hori Rami for not doing his job. And I am registering my complaint against Police Officer Moshe Cheededah for refusing to do his job. All of the e-mails, their enclosures, and all of the evidence that I have presented to the Internet Public regarding this matter you can locate on my website (URL) www.bullcrapbusters.com on my web page (html) “Updates 8/10/10”. That is if you are interested in doing your job versus accepting bribes that endanger peoples' lives. If you intend to reply then you must do so in writing so that I can document what you have to say. If the reader is interested in viewing fax #2 then please go to hyperlink 95B at www.bullcrapbusters.com. Did you receive my fax sent to you on July 24, 2018? If the reader is interested in viewing the fax already successfully sent then please go to hyperlink 95A at www.bullcrapbusters.com. If the reader is interested in viewing the e-mail then please go to hyperlink 91A at www.bullcrapbusters.com. “The fax was not received. If the reader is interested in viewing fax #1 already successfully sent then please go to hyperlink 95A at www.bullcrapbusters.com. If the reader is interested in viewing the e-mail in English then please go to hyperlink 91B at www.bullcrapbusters.com. If the reader is interested in viewing the e-mail in Hebrew then please go to hyperlink 91C at www.bullcrapbusters.com. According to the online Encyclopedia called Wikipedia the word "triangulation" refers to a manipulative device to engineer rivalry between two people. If the reader is interested in viewing Wikipedia on Triangulation then please go to hyperlink 99I at www.bullcrapbusters.com. 1) Police Officer Moshe Chadeedah met with my neighbor, Susana Vexler. 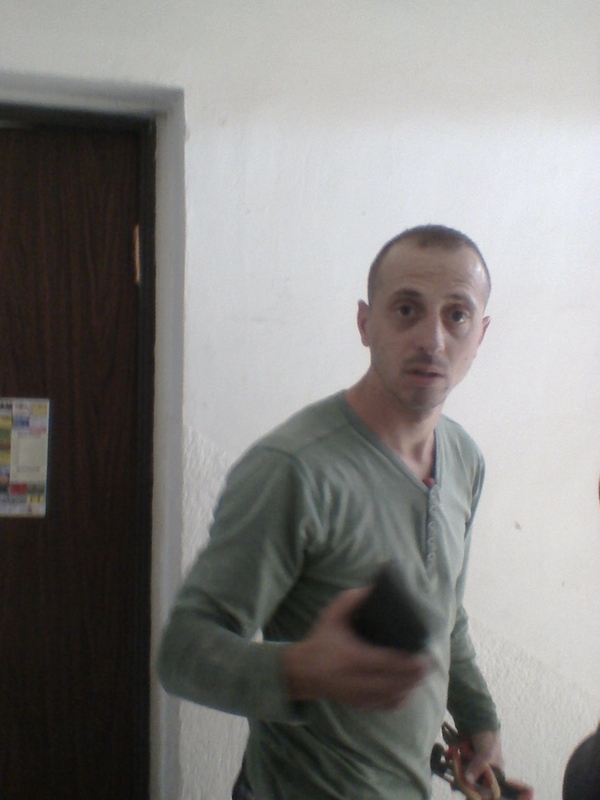 2) Police Officer Moshe Chadeedah did not inform me as to what he and Susana Vexler's conversation was about. 3) I reported to Police Officer Moshe Chadeedah that I have a history with Susana Vexler. So I have reason to believe that she posted a threatening note to me. The threatening note was right there staring him in the face. Yet he said and did nothing. 4) I reported to Police Officer Moshe Chadeedah that I have a history with Susana Vexler. So I have reason to believe that she threw egg all over my door and porch. The egg vandalism was right there staring him in the face. Yet he said and did nothing. The only something Police Officer Moshe Chadeedah said to me was, "Who is your landlord?" and without having any reason to ask me such a question. My answer was, "That is none of your business!" Menachem Snoyman came to my spouse’s apartment to collect the 12 rent checks and 4 security checks from me for the apartment I was renting from him for the year. But to my utter surprise he was very rude to me and without provocation. He said, “Thank you both for setting up an appointment with Moshe the plumber, especially Michael.” And he said “Hello” and “Goodbye” and “How are you?” to Michael who is my spouse, but not to me. My spouse is not renting an apartment from him, I am. Last year I gave him one rent check in the form of a cashier's check for the entire year. Who does that? I told him, "I am amused that you are ignoring me. I am your income." Less than two weeks after Police Officer Moshe Chadeedah inquired as to whom my landlord was, all of the sudden for the first time ever Landlord, Menachem Snoyman, was being nasty to me for no reason. How WEIRD! Both my spouse and I got upset with my landlord. And "click" we hung up our phone. 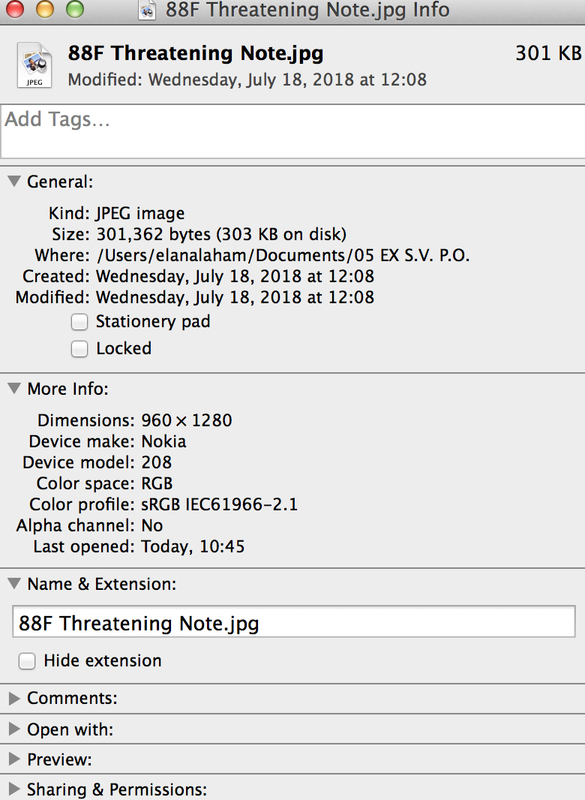 On July 18, 2018, a THREATENING NOTE was addressed to me. Since I have a history with my next-door neighbor Susana Vexler I have reason to believe that she wrote the threatening note to me. The threatening note was not only in violation of my Protection Order against her but a crime in and of itself with or without a Protection Order. The threatening note communicates that Susana Vexler intends to continue to HARASS me. The threatening note is vague. So it can mean anything from vandalizing my property to stealing my belongings to murdering me. And Susana Vexler is perfectly capable of committing violence against me being that she harbored her boyfriend, Vitlay Zezkav, who, on December 31, 2016, committed assault and battery on me (Case #5390-04-17). FIVE TIMES in contempt of court Susana Vexler violated my other two Protection Orders against her when they were valid by a) addressing a threatening note to me and b) vandalizing my property and c) putting her trash on my side of the hallway and d) making contact with me. On September 2, 2018 @ 10:30 a.m., we went to the Akko Magistrate Courthouse to petition for a third Protection Order against Susana Vexler because my second Protection Order against her expired on August 13, 2018. Susana Vexler was not present at my scheduled Hearing. Judge Zahava Banar, who was the judge that presided over my Hearing, granted me a one way Protection Order against Susana Vexler, but ruled an absurd verdict that it was only to be valid for the duration of one month when I had requested a Protection Order against Susana Vexler for as long as the law allows, which is six months (Case #51818-08-18). 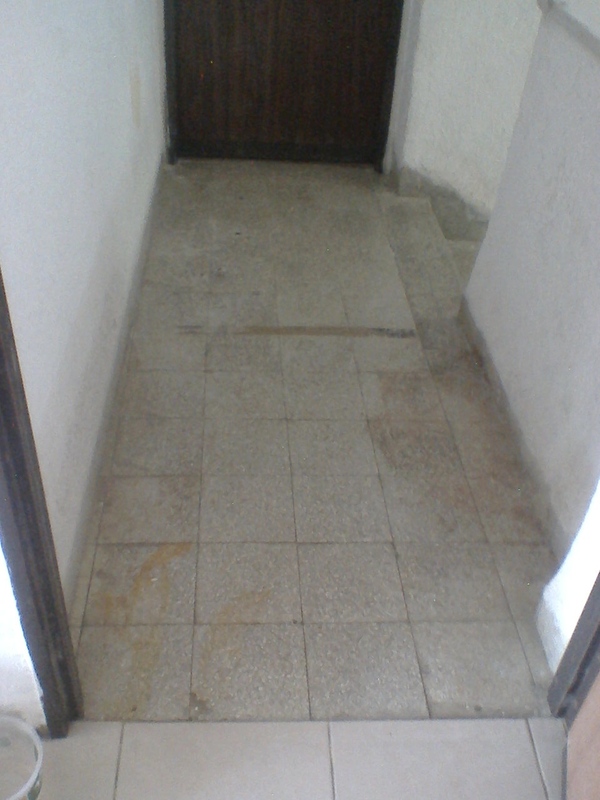 I called my landlord Menachem Snoyman on my phone to inform him that I had to vacate his apartment, as my life was endangered, since the Court refused to grant me a third Protection Order against Susana Vexler for a reasonable duration of validity, and because the Police refused to enforce the other two Protection orders that I previously had against Susana Vexler. Instead of listening to what I had to say, my landlord Menachem Snoyman called me “an insidious person” and hung up his phone on me. I called landlord Menachem Snoyman on my spouse’s phone. He answered his phone with a greeting of “yes”. I said to him, “You are a wicked person” and I hung up my phone on him. I sent landlord Menachem Snoyman an e-mail for legal reasons in order to document in writing that I was giving him my notice to vacate his apartment and my legitimate reason why. “You INSIDIOUS bully coward. NO read YES deleted your e-mail I received on 9/4/18. Menachem Snoyman, you believed whatever the police lied to you about me because my neighbor Susana Vexler gave them a bribe, instead of judging me by my behavior as the best tenant any landlord can hope to have. One year's cashier's rent check I paid you for the entire year, plus paying all the bills, fixing things so as not to bother you, keeping clean your property, and being a quiet resident - that is what I did for you!!! You are so stupid you do not even know what is in your own best interest. On September 3, 2018, due to my life being in DANGER, after I locked the apartment's front door, I vacated, and I sent to you your House Key via registered mail. Susana Vexler addressed a threatening note to me, which was in violation of my Protection Order against her and a crime in and of itself. The threatening note is vague. So it can mean anything from vandalizing my property to stealing my belongings to murdering me. And Susana Vexler is perfectly capable of committing violence against me being that her boyfriend, Vitlay Zezkav, had already committed assault and battery on me. The bribed off Karmiel Police and the bribed off Akko Magistrate Court are refusing to do anything about it. See attachment 07A the threatening note to this e-mail for details. According to the Lease the provision you had for me vacating early was item #6, which stated, "Should the rentee decide to VACATE before the termination of this agreement, he will be liable for one month's rent from the notification of his intent to leave". But you crossed it out. So I do not owe you any money. And I am giving you notification of my intent to leave right now before 9/10/18, when my next month's rent was due. It also states in the Lease, "Both parties wish to define their relationship, mutual privileges, and obligations in this following agreement." So the Lease is the entire legal agreement between us, and no law beyond the Lease is applicable. See attachment 15I, 15J, 15K and 15T the Lease to this e-mail for details. I left your apartment clean even though it was a mess when I entered your apartment to rent it. 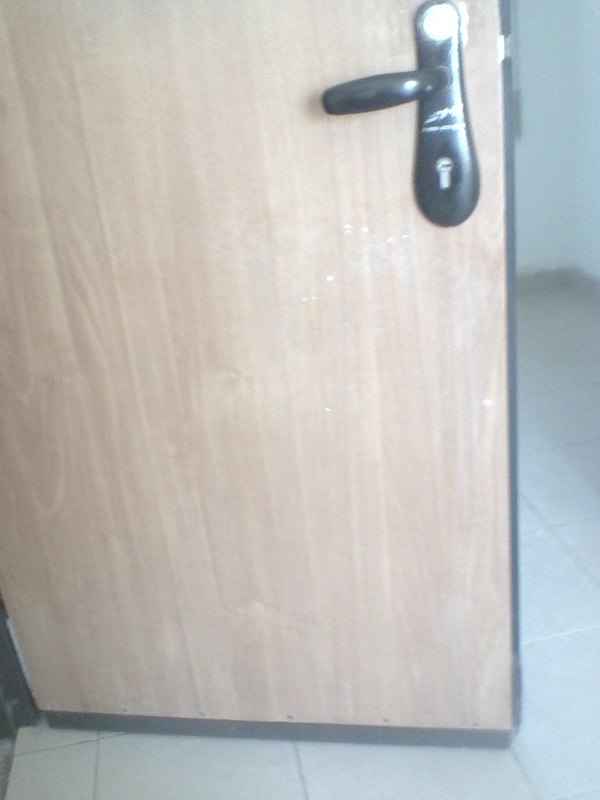 So you ought to have no difficulty in getting another tenant. If the reader is interested in viewing the e-mail I sent to landlord Menachem Snoyman then please go to hyperlink 99J at www.bullcrapbusters.com. I sent landlord Menachem Snoyman an e-mail to let him know about the web pages I wrote that explain why I was forced to vacate his apartment and to let him know about the web page I wrote about him. ​ If you are interested in the facts instead of hating me because I am the best tenant a landlord can hope to have and since I am a nice person then go to web pages Updates 3/26/17, Updates 4/30/17, Updates 5/16/17, Updates 12/31/17, Updates 8/9/18, and Updates 8/10/18 to know why I had to vacate your apartment. On 9/3/18, due to my life being in DANGER, I was FORCED to vacate your apartment. As I promised enjoy your negative Internet publicity on my popular anti-bullying website (URL) www.bullcrapbusters.com on web page (html) "Updates 8/10/18" in the section called, "Triangulation Landlord Menachem Snoyman". If the reader is interested in viewing the e-mail I sent to landlord Menachem Snoyman then please go to hyperlink 99K at www.bullcrapbusters.com. A lesson to be learned! Who do you trust? You judge a person by his BEHAVIOR not by his WORDS. Landlord Menachem Snoyman ought to have had faith in me, as I had a track record for three years of being an excellent tenant. Instead, he believed in a stranger’s – bribed off Police Officer Moshe Chadeedah’s – empty lying words. Landlord Menachem Snoyman has a lawyer. If landlord Menachem Snoyman chose not to ruin our relationship by being willing to learn this lesson then he woulda, shoulda, coulda sue the Police, the Court, and Susana Vexler for causing him to lose me as his tenant of three years and counting who paid and stayed and took care of his property. He woulda, shoulda, coulda go onto my website and gather all the evidence showing that I was forced to move out of my home due to bribery. And if he won his lawsuit he woulda, shoulda, coulda invite me to come back and be his tenant. Now he has to worry that future tenants will not renew their Leases with him because no one wants or needs a neighbor who blocks their exit and entrance way with her trash, which brings coach roaches into their home just to HARASS them. 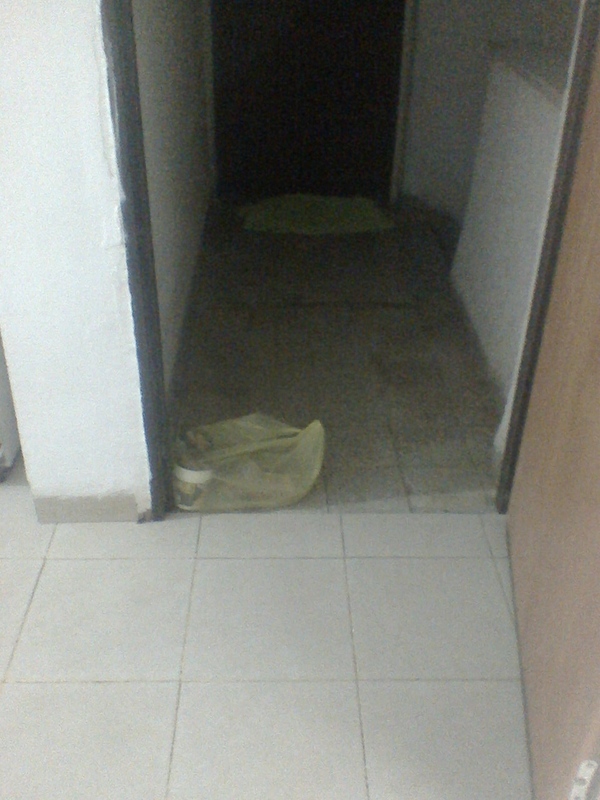 So unless by some miracle Susana Vexler is not going to leave her trash on landlord Menachem Snoyman’s apartment’s side of the hallway anymore, he will have revolving tenants every year if he can even get a tenant every year to rent his apartment on 23 HaGalil Street #9, Karmiel 2191112 Israel. Do I feel bad or think it is awful that I lost my home? No! Because I don’t want to pay money to a landlord like that! I don’t need to support such a person’s existence! I saw my neighbor, Susana Vexler, who lives in apartment #10, exit her apartment. She met two police officers who I saw coming up the stairs. I heard her and the police officers talking, but I do not know what they were saying because they were speaking in Hebrew and my Hebrew is limited. I reported to Police Officer Moshe Chadeedah that I have a history with Susana Vexler. So I have reason to believe that Susana Vexler had posted a threatening note to me. HAS NOT BEEN CANCELLED YET!" See photos of threatening note. 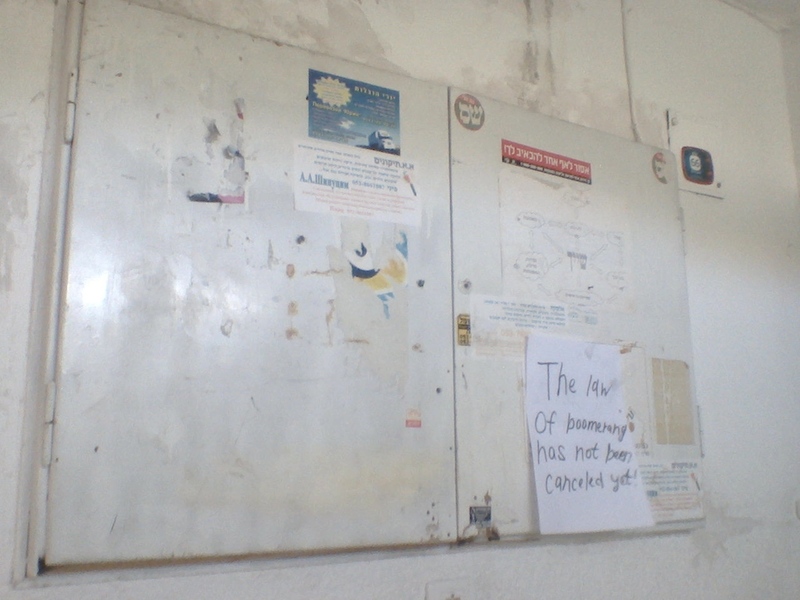 The threatening note is on Susana Vexler’s side of the electric box on Susana Vexler’s side of the hallway. 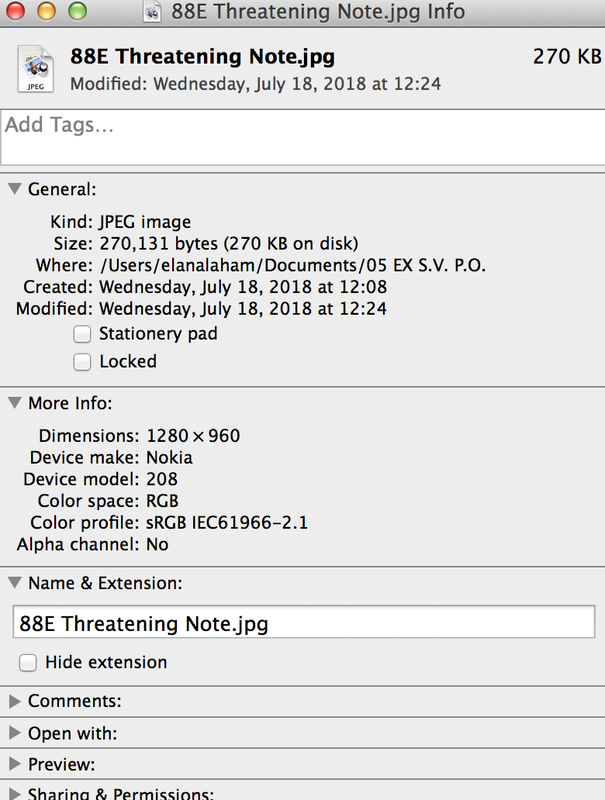 If Susana Vexler did not put the threatening note on there then why didn’t Susana Vexler take the threatening note off? I noticed the note at about 12:00 noon. (With gloves) I removed the note at around 6:00 p.m.
Susana Vexler and I are the only residents who live on the top floor. Susana Vexler speaks English and knows that English is the only language I speak well. Susana Vexler made verbal contact with me in perfect English on July 29, 2018, when she said to me, "This is what he said to you." I am an American. 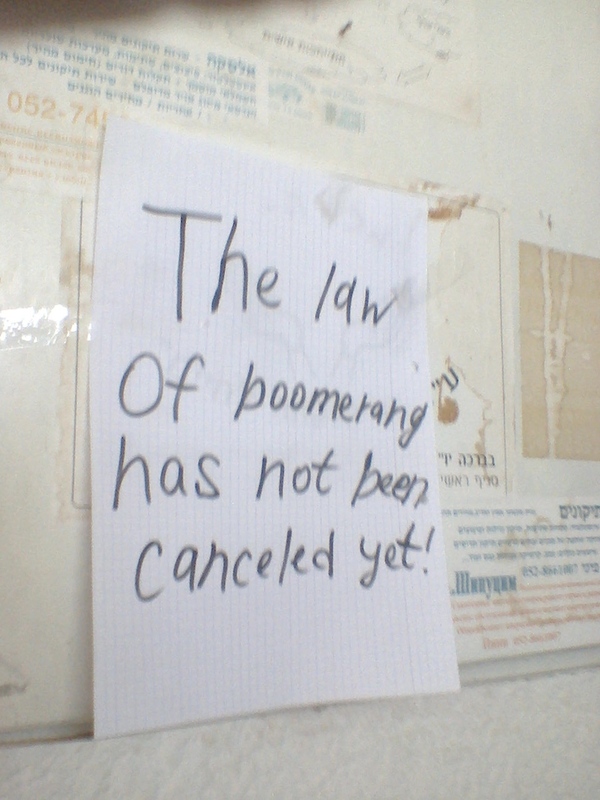 So I will say, "The Law of Kharma" not the "Law of Boomerang". I do not write my printed letters the way they are written on the threatening note. SUSANA VEXLER INTENDS TO CONTINUE TO HARASS ME IN CONTEMPT OF COURT AND IN VIOLATION OF MY PROTECTION ORDER AGAINST HER. THE THREATENING NOTE IS VAGUE. SO THE THREAT CAN MEAN ANYTHING FROM VANDALISING MY PROPERTY TO STEALING MY BELONGINGS TO MURDERING ME. WITH OR WITHOUT A PROTECTION ORDER IT IS A CRIME TO MAKE THREATS IN AND OF ITSELF. Such is in contempt of Court and in violation of my Protection Order against Susana Vexler, which is valid until August 13, 2018. On July 24, 2018, I reported to the Karmiel Police Department that Susana Vexler in contempt of court had violated my Protection Order against her, and I filed Police Report #334154 against Susana Vexler for the threatening note crime. 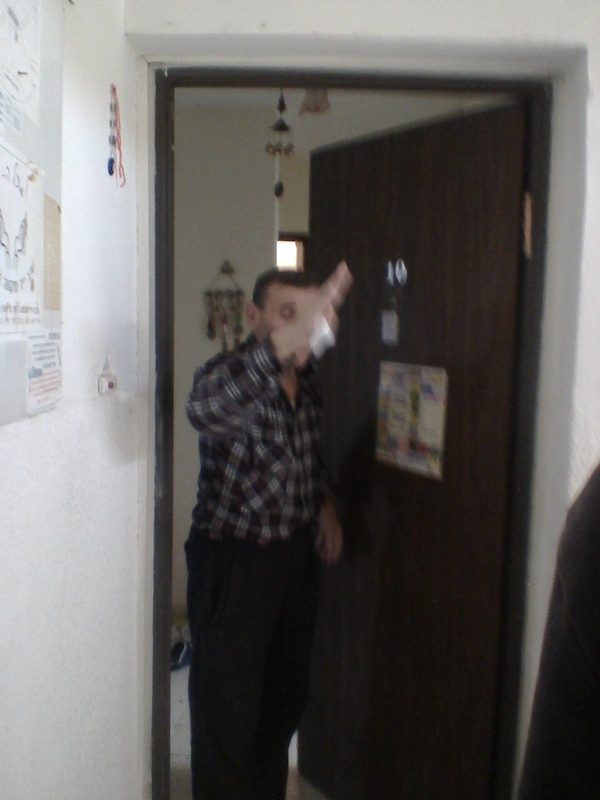 The Karmiel Police refused to enforce my Protection Order against Susana Vexler. IF THE READER IS INTERESTED IN VIEWING POLICE REPORT #334154 THEN PLEASE GO THE HYPERLINK 93C AT WWW.BULLCRAP BUSTERS.COM. a) demand that Susana Vexler tell them who wrote the threatening note. b) dust the threatening note for fingerprints and obtain fingerprints from Susana Vexler to see if they match the fingerprints on the note. c) analyze the handwriting of the threatening note and obtain a sample of handwriting from Susana Vexler to see if it matches the handwriting on the note. d) press charges against the individual whose fingerprints are on the note and/or whose handwriting matches the writing of the note, and/or who confesses to writing the note. At about noontime I was sweeping my home. When I opened my door to sweep my side of the hallway I saw broken egg shells and egg yolk that had been thrown all over my apartment’s front door and my apartment’s front porch. I swept the eggshells into my dustpan. See photos of eggshells and egg yolk. I saw my neighbor, Susana Vexler, who lives in apartment #10, exit her apartment. She met two police officers who I saw coming up the stairs. I heard her and the police officers talking, but I do not know what they were saying because they were speaking in Hebrew and my Hebrew is limited. The police saw me sweeping the eggshells into my dustpan. I closed my door and threw the eggshells away into my trash. I reported to police officer Moshe Chadeedah that I have a history with Susana Vexler. So I have reason to believe that she threw egg all over my door and porch. 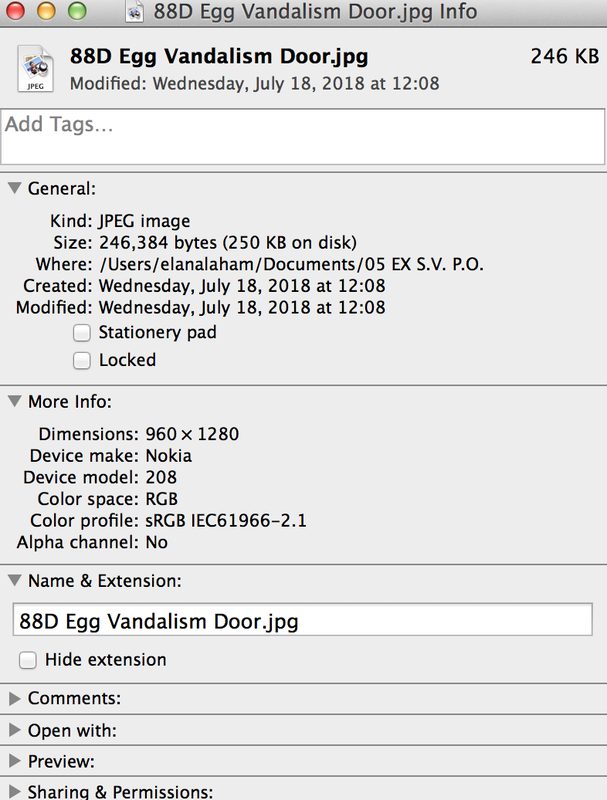 On July 24, 2018, I reported to the Karmiel Police Department that Susana Vexler in contempt of court had violated my Protection Order against her, and I filed Police Report #334154 against Susana Vexler for the vandalism violation. 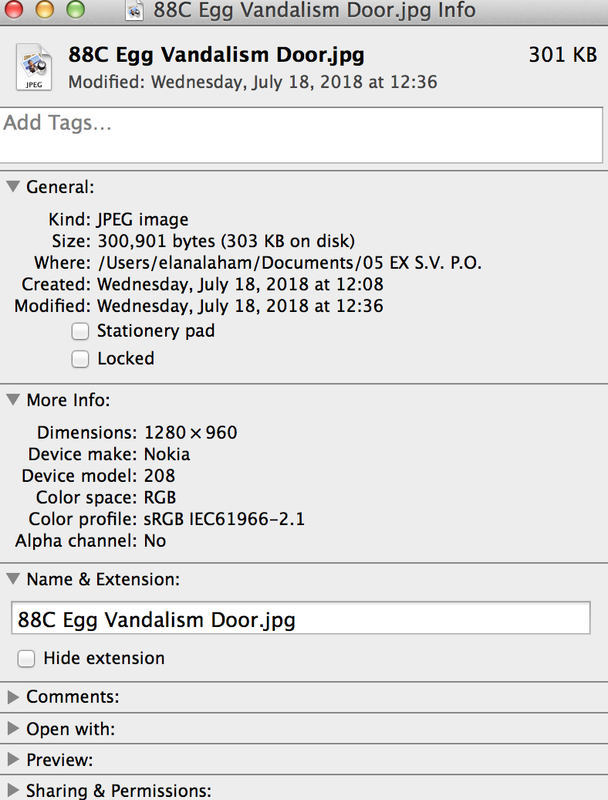 Why didn’t Officer Moshe Chadeedah question Susana Vexler about the egg vandalism that he saw with his own eyes on my door? 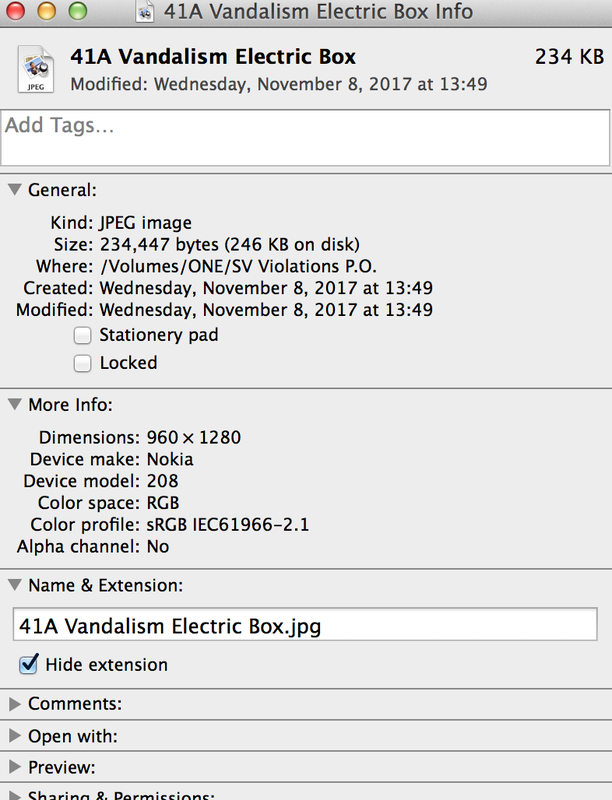 Why didn’t Officer Moshe Chadeedah question Susana Vexler about the threatening note that he saw with his own eyes on the electric box and seize it for fingerprints and handwriting samples? Why, did Officer Moshe Chadeedah refuse to file a police report for me against Susana Vexler when I requested him to do so? Instead, Officer Moshe Chadeedah’s “police response” was to tell me that he is going to contact a division of City Hall that deals with disputes between neighbors. For the record, City Hall did not contact us. Chadeedah accepted a bribe offer from Susana Vexler. It is the Karmiel Police Department’s duty to enforce the Protection Order that the Akko Magistrate Court granted me against Susana Vexler, not to refuse to do their job. Date: 7/20/18 @ 1:45 a.m.
At about 1:45 in the morning I awoke and went to my kitchen to get a cup of water when I heard a noise that sounded like plastic rubbing against my apartment front door. I opened my apartment front door to see next to my apartment front door on my porch on my side of the hallway a yellow bag that had white grain crackers and white grain soup noodles in it. 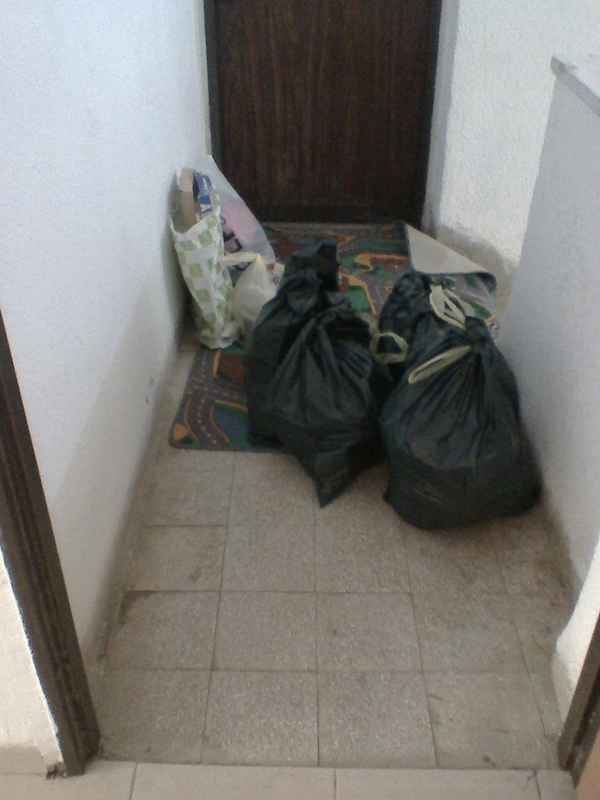 I have a history with Susana Vexler of her putting her trash in the section next to my apartment door. So I have reason to believe that she put the trash by my door and porch. 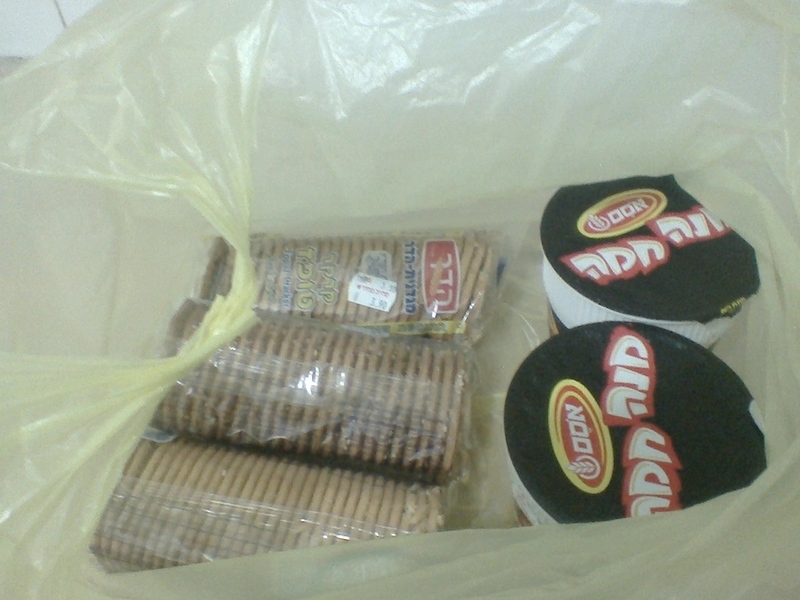 If Susana Vexler were to claim that this is her trash that I put on my side of the hallway then why is it lying outside at all when it is food? 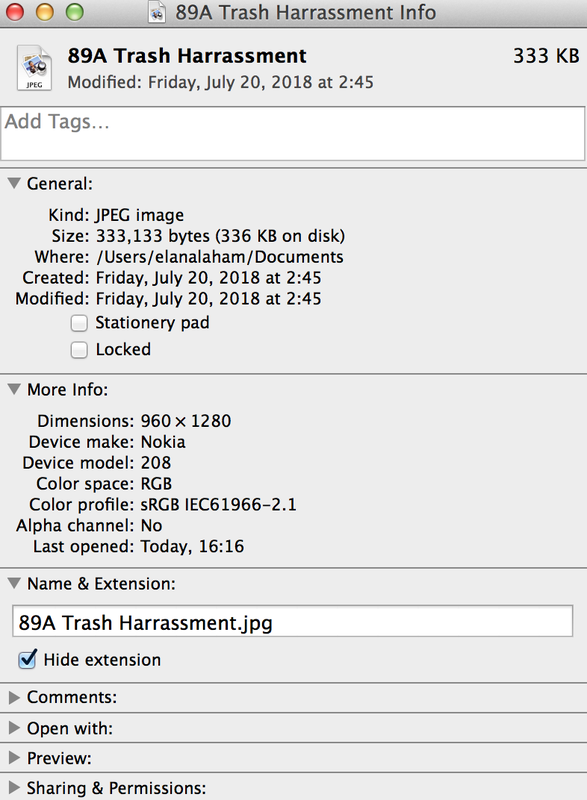 See photos of trash harassment. 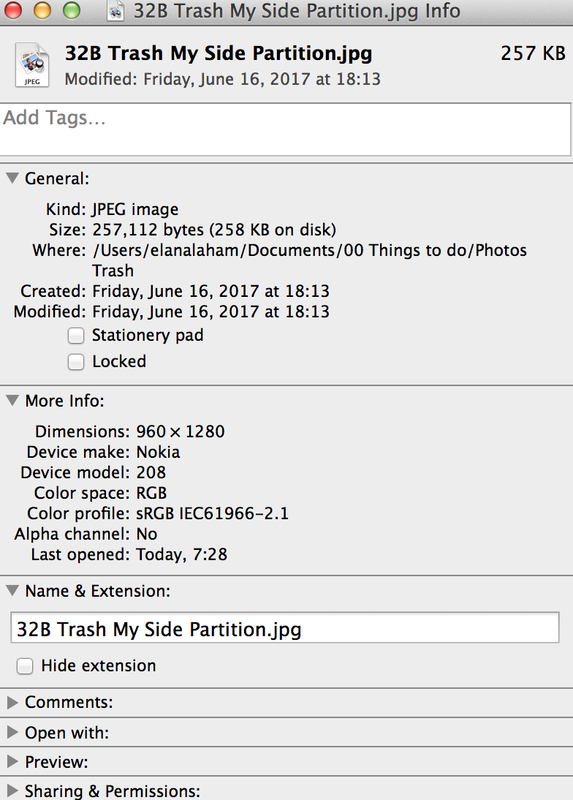 I have proof the trash is not mine. I do not eat white grain. I am allergic to white grain. 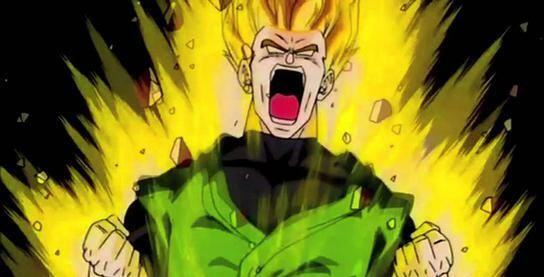 White grain makes me constipated. See photos of trash ingredients. On July 24, 2018, I reported to the Karmiel Police Department that Susana Vexler in contempt of court had violated my Protection Order against her, and I filed Police Report # 334154 against Susana Vexler for trash harassment. Date: 6/16/17 @ 6:13 p.m.
On June 16, 2017, Susana Vexler put her trash on my side of the hallway. Such is in contempt of court and in violation of my Protection Order against Susana Vexler, which is valid until August 13, 2017. On June 25, 2017, I reported to the Karmiel Police Department that Susana Vexler in contempt of court had violated my Protection Order against her, and I filed Police Report #275814 against Susana Vexler for trash harassment. IF THE READER IS INTERESTED IN VIEWING POLICE REPORT #275814 THEN PLEASE GO THE HYPERLINK 93A AT WWW.BULLCRAP BUSTERS.COM. On July 29, 2018 @ 4:20 p.m.
At about 4:20 in the afternoon I heard noises in the hallway. I looked thru my apartment front door’s peephole to see what was happening. I saw Susana Vexler standing in front of her apartment’s front door and a man with a ladder going to the roof. 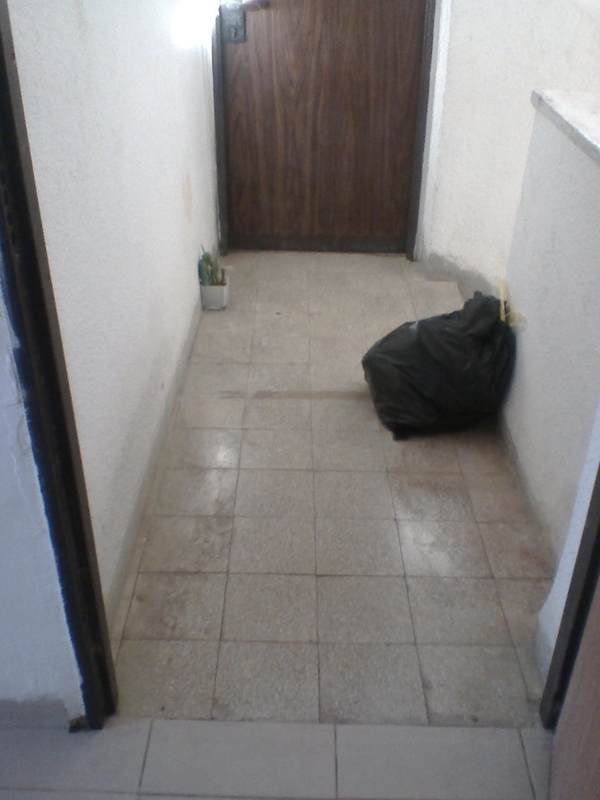 I opened my apartment’s front door and took a photo of him because I did not know why he was there and since the last time Susana Vexler had males enter my side of the hallway they vandalized my side of the electric box. [See the Police Officer Estie Ridler section of this web page entitled “Updates 8/10/18” of the BullCrap Busters website for details]. My spouse was with me. After I snapped the picture of the unknown male, Susana Vexler laughed. Then, the male said something to me in Hebrew I did not understand. So I told him, ‘”I do not understand you. 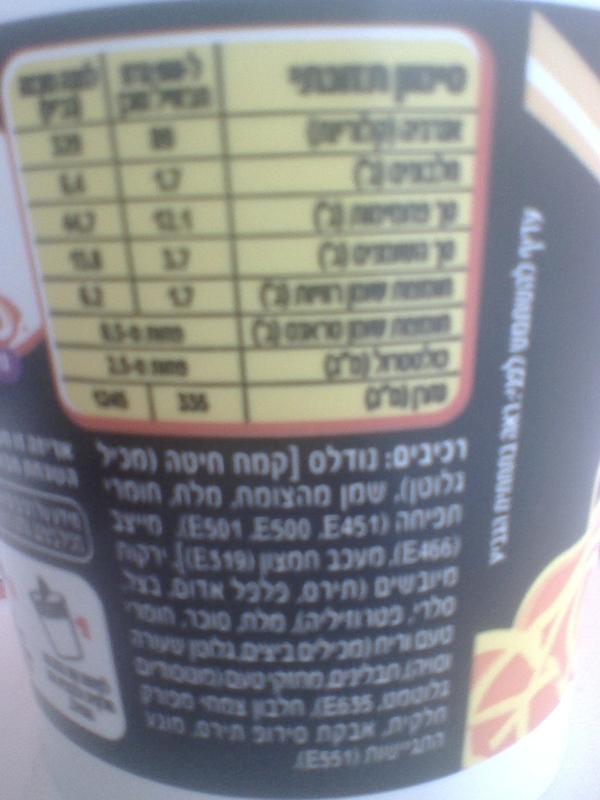 My Hebrew is limited. Do you speak English?” Before he was able to answer me Susana Vexler said to me in perfect English, “This is what he said to you...” We did not hear anything else she said because my spouse and I went into my apartment and closed my apartment’s front door. If the reader is interested in viewing the photo then please go to hyperlink at www.bullcrapbusters.com. Such is in contempt of court and in violation of my Protection Order against her, which is valid until August 13, 2018. On July 29, 2018, I reported to the Karmiel Police Department that Susana Vexler in contempt of court had violated my Protection Order against her, and I filed Police Report #342093 against Susana Vexler for contacting me. IF THE READER IS INTERESTED IN VIEWING POLICE REPORT #342093 THEN PLEASE GO THE HYPERLINK 93D AT WWW.BULLCRAP BUSTERS.COM. On November 8, 2017 at about 1:40 p.m., while talking to my spouse on my cell phone, I heard a noise that sounded like glass being broken. I looked thru my apartment front door’s peephole and saw a male I do not know accompanied by Susana Vexler’s father breaking a piece of wood off my side of the electric closet. I was unable to take a photo of what they were doing thru my apartment front door’s peephole because there was too much light flooding the hallway and I was not able to open my door and take a photo of what they were doing since they might attack me like Susana Vexler’s boyfriend, Vitlay Zeztkav, did. So I told my spouse to come over to my apartment. He did. 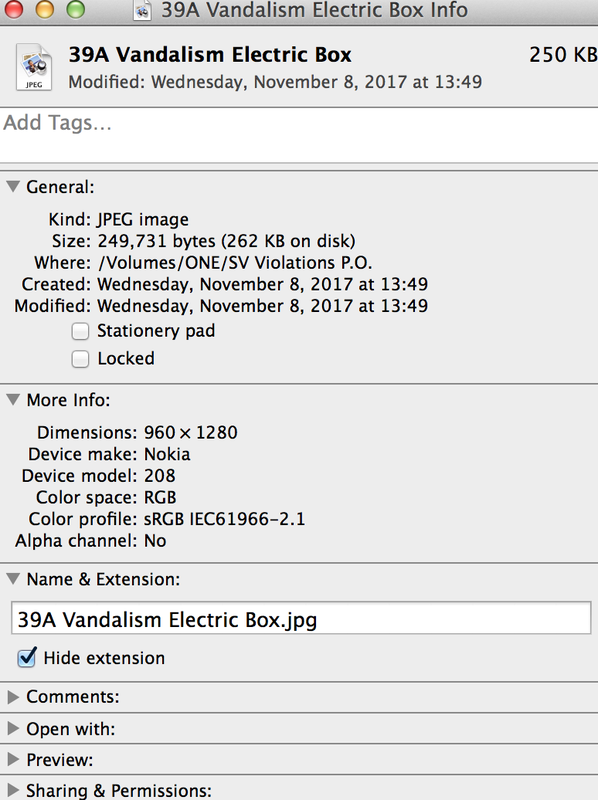 In my spouse’s presence, I quickly took photos of the two males who vandalized my side of the electric closet and the vandalism they committed against my side of the electric closet. 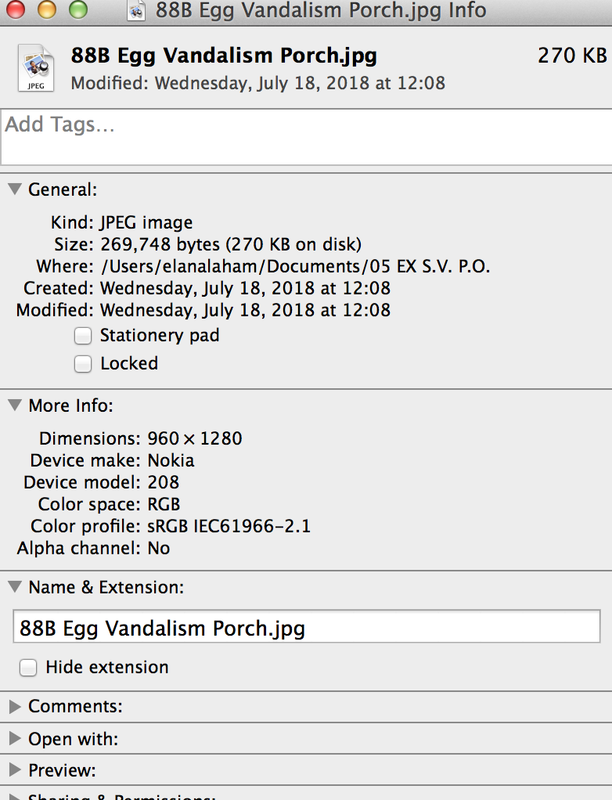 I reported to Officer Estie Ridler of the Karmiel Police Department and filed Police Report #495541 that Susana Vexler’s father and an unknown male vandalized public property. IF THE READER IS INTERESTED IN VIEWING POLICE REPORT #495541 THEN PLEASE GO THE HYPERLINK 93B AT WWW.BULLCRAP BUSTERS.COM. 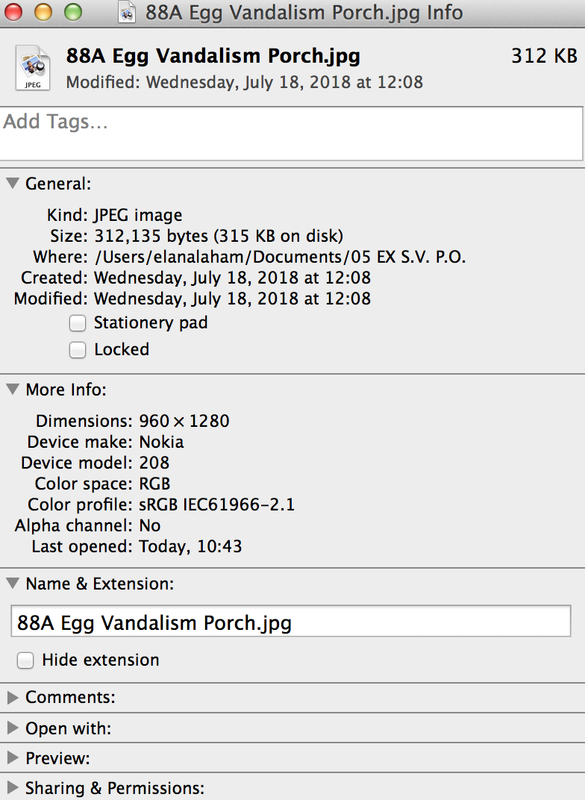 I told Officer Estie Ridler that I eye witnessed and ear witnessed Susana Vexler’s father being an accomplice to an unknown male who committed vandalism against the electric company’s property and I showed her the photos I took of the event. One of my photos captured the unknown male carrying a pipe wrench in his left hand. My spouse, who worked for the Boeing Company for 25 years as an electrical engineer, informed Officer Estie Ridler that a pipe wrench is not a tool that an electrician uses to do electrical work. We also informed Officer Estie Ridler that if it was necessary for Susana Vexler’s father to repair some electrical malfunction in Susana Vexler’s apartment then there was no reason for this unknown male and Susana Vexler’s father to be on my side of the electric closet. 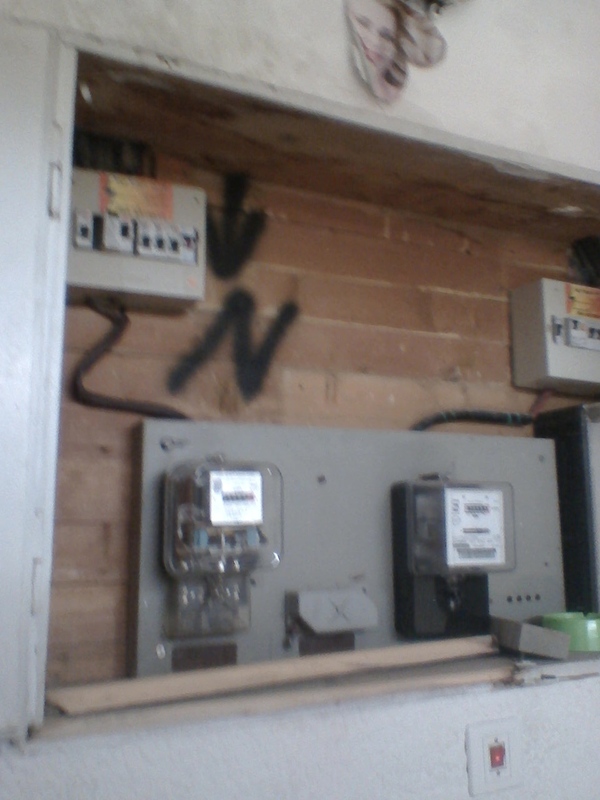 Officer Estie Ridler’s “police response” was to believe Susana Vexler’s story that the vandalism to our side of the electric box was an accident, and that the male who accompanied Susana Vexler’s father was an employee of the electric company. While Officer Estie Ridler was talking to Susana Vexler on the phone at the front desk of the Karmiel Police Department, I heard Officer Estie Ridler call Susana Vexler in Hebrew “Motek”, which in English means “Sweetie”. Imagine that! Police Officer Estie Ridler knew that Susana Vexler harbored her boyfriend, Vitlay Zezkav, who committed assault and battery on me, yet she called her “Sweetie”. The only reasonable conclusion I can make based upon the observables as to why Officer Estie Ridler was biased against us by refusing to do her job by ignoring the evidence and the facts that we presented to her by believing non credible Susana Vexler instead of credible us, and by doing nothing about the crime was because Officer Estie Ridler accepted a bribe offer from Susana Vexler. SUSANA VEXLER has been HARASSING me since I moved into my apartment on August 10, 2015. This was when she insisted on leaving her trash on my side of the hallway and in a way that blocked my entrance to and my exit from my apartment and invited coach roaches into my home. as a depository for her trash. [See the web page entitled, "Path of the Mystic Warrior Part II Updates 3/26/17" for details - Susana Vexler Will Not Take Her Garbage Out]. [See the web page entitled, "Path of the Mystic Warrior Part III Updates 4/30/17" for details - Vitlay Zezkav Protection Order]. [See the web page entitled, "Path of the Mystic Warrior Part IV Updates 5/16/17" for details - Susana Vexler Protection Order]. [See the web page entitled, "Path of the Mystic Warrior Part V Updates 12/31/17" for details - Susana Vexler Lawsuit]. But if this is the reason then the blatant solution to the absurd problem is for her to simply remove her trash from my side of the hallway. So why doesn't she? Because she is a bully coward searching for a victim to get her fix for her bullying addiction. And not even under the guise of a false accusation. [See the section called “Anger – What It Can Teach Us” of the Introduction web page of the BullCrap Busters website for more details about the addiction to bullying]. This being the case, you might ask, "Well Gee, Elana Laham why don't you just move away?" Moving away from the bully coward is not the answer! If it were we woulda, shoulda, coulda not be living in a world, in which BULLYING is a worldwide epidemic. If we do nothing about the bully coward then bullying will continue to grow like a cancer. So what do you do if moving away is not the solution to the bullying problem? Fight back! Chances are you will win because the bully coward does not expect you to since we live in a Bully Culture that conditions all of us to believe that you ought to just flee from the bully coward because the bully coward is RELENTLESS. Your safety is a priority. If you become endangered by the bully coward who only appears to be RELENTLESS because most of the world SUPPORTS BULLYING since most of the people on planet Earth have chosen to be corrupt then move away. ￼￼ For example, all I can conclude from the Karmiel Police Department is that they have accepted a bribe offer from Susana Vexler in order to do her bidding. How else to explain the Karmiel Police Department's BIAS against me by refusing to Enforce my Protection Order against her. [See Police Reports above for details]. There is no shame in moving away when you are one tin soldier fighting against a gang of bully cowards who are putting your health and well being in danger. And it is called retreating not fleeing for it is the strategic thing to do. So that you can live to fight another day. United States President George Washington won many of his battles against the British by retreating. The other side of the coin of Bully is Coward. United States President Harry Truman said about the Ku Klux Klan, "They were a rough bunch, but rough only in a bunch." In other words, the bully coward can only be relentless if others are willing to fight for the bully coward. If the bully coward has to fight all alone then all you have to do is blow on the bully coward and the bully coward will collapse. The reason for this is because the bully coward is weak since the bully coward is "hyper diaper" sensitive being that the bully coward makes a big deal out of nothing. 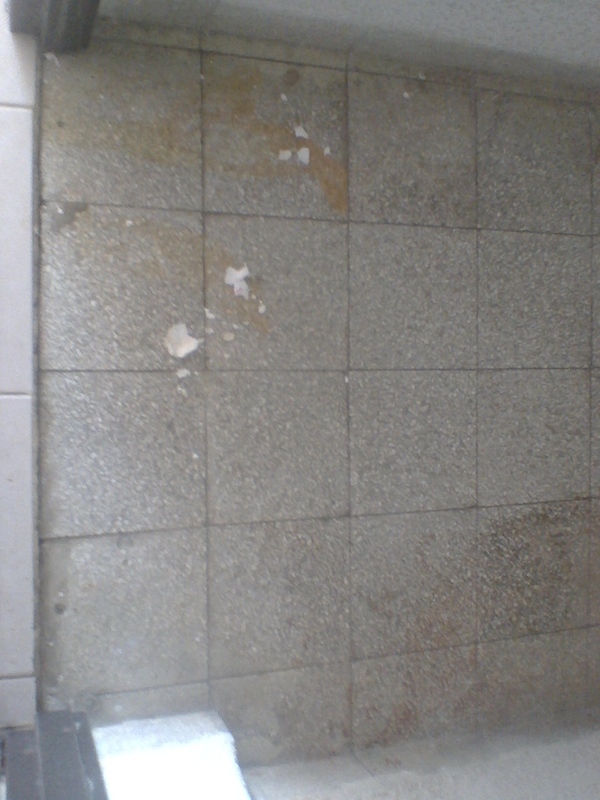 For instance, Susana Vexler is upset that it is not okay for her to put her trash on my side of the hallway. So she has instigated World War III against me in the little State of Israel in which War can ensue at any moment with the millions of Arabs in the Arab surrounding countries whose hope it is to shove the Jewish State of Israel into the Mediterranean Sea. The Bully Culture will also have you believe that the victim is RELENTING since the victim is "super" sensitive. But the victim does not make a big deal out of nothing because the victim is too busy having to endure an entire life time of onslaught bullying persecution. So it is the victim who is strong and has the STAMINA. For it is the victim who has to fight back and all alone against hoards of bullying and without any help from any one. C) THE ISRAELI POLICE, MURDERED ME.